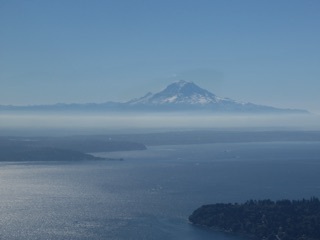 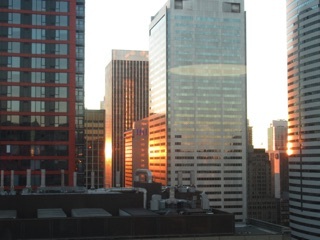 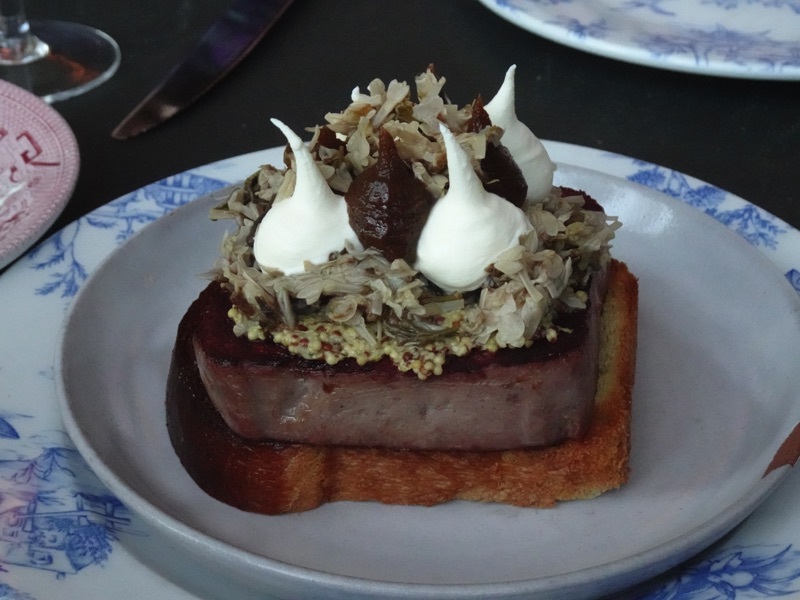 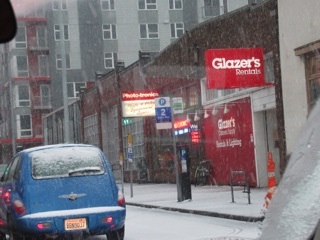 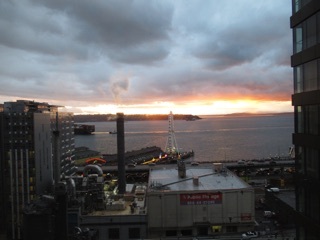 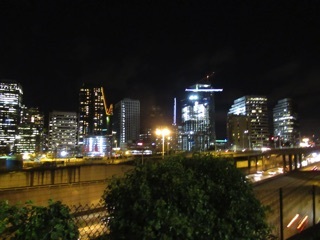 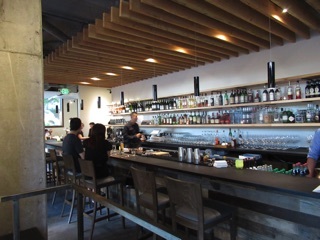 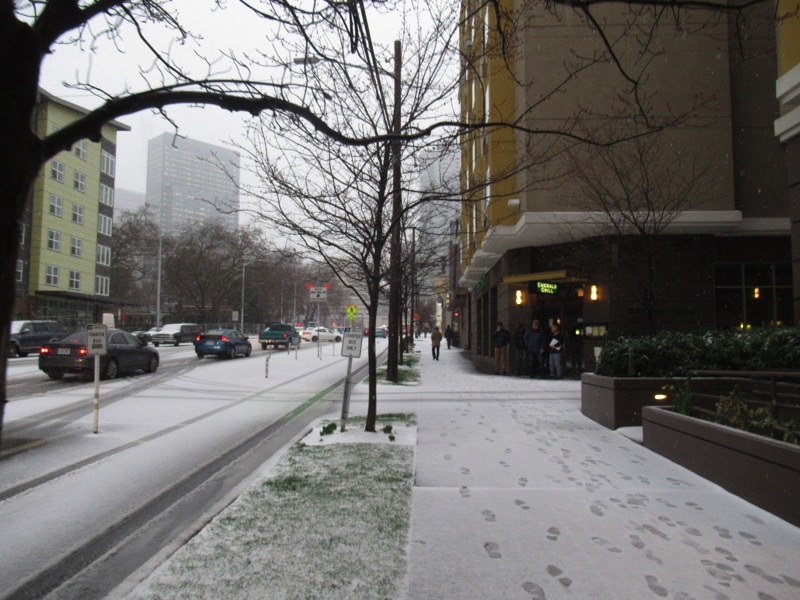 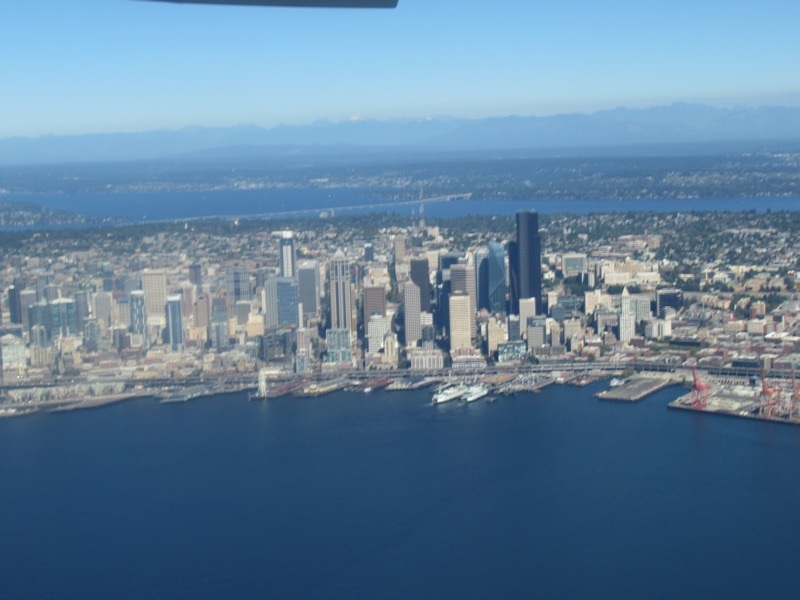 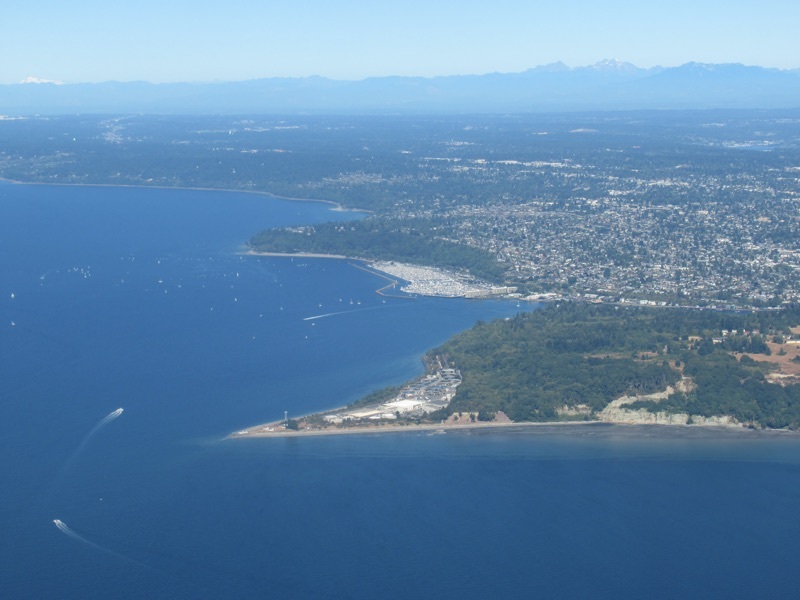 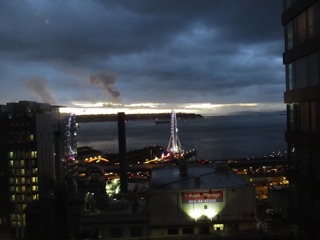 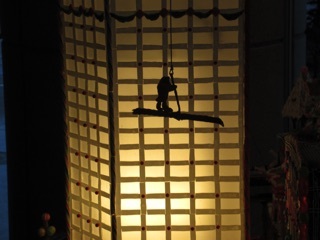 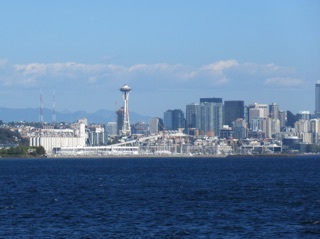 For more on Seattle and Seattle Restaurants, see our Seattle web page. 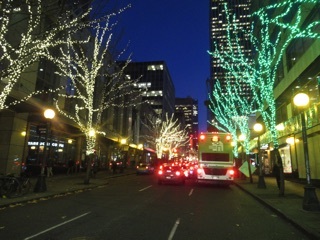 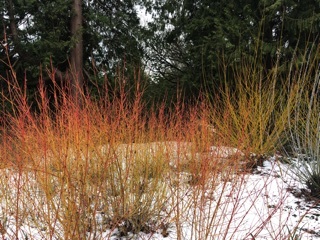 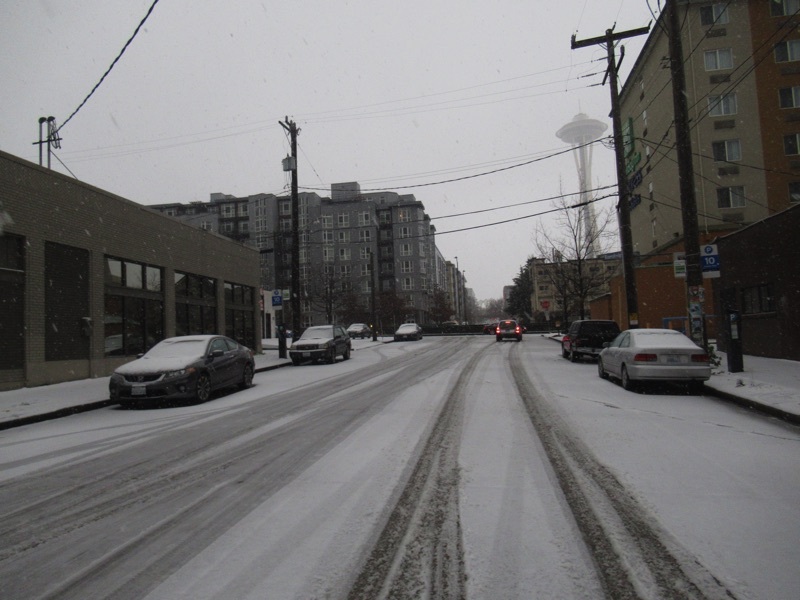 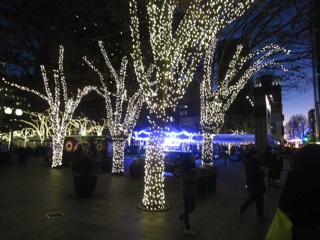 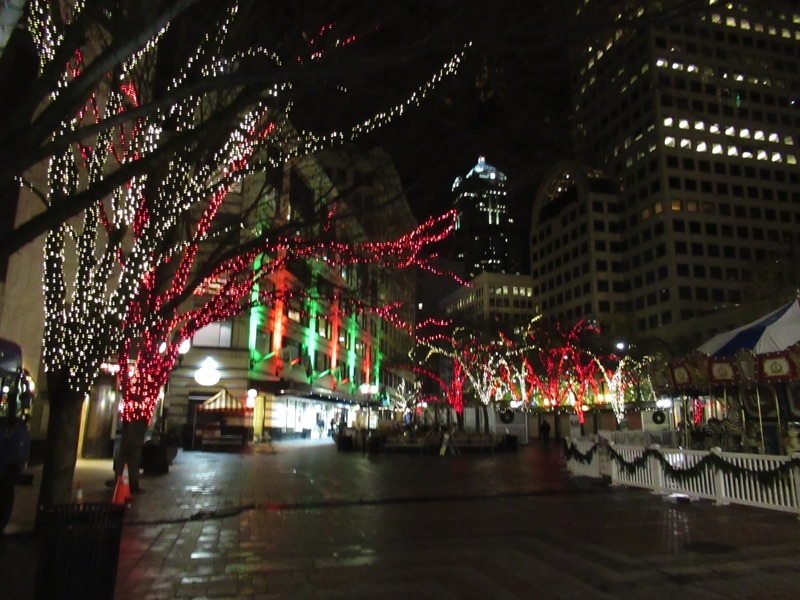 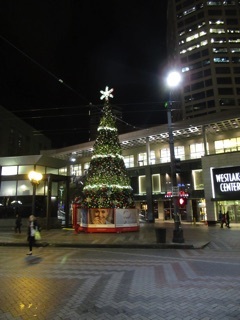 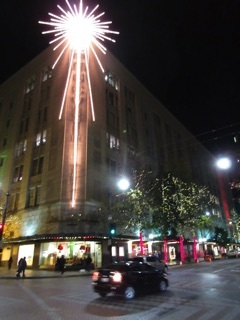 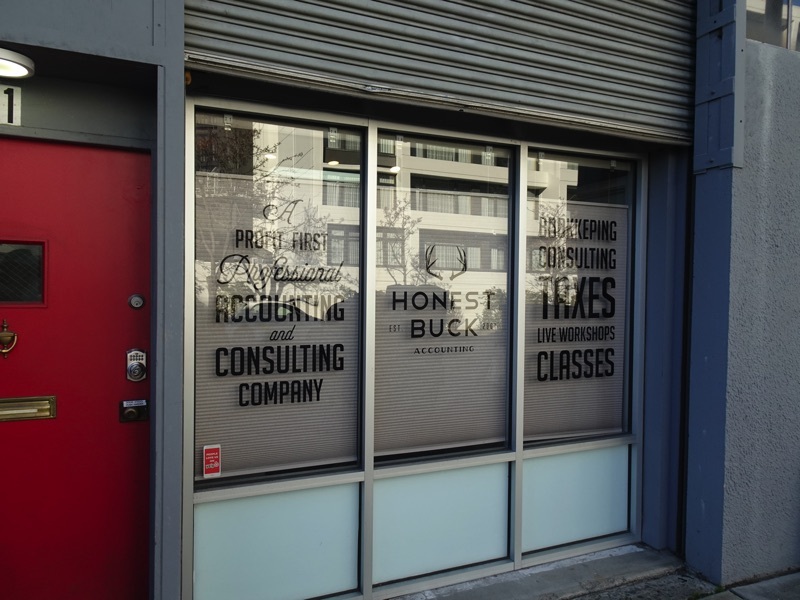 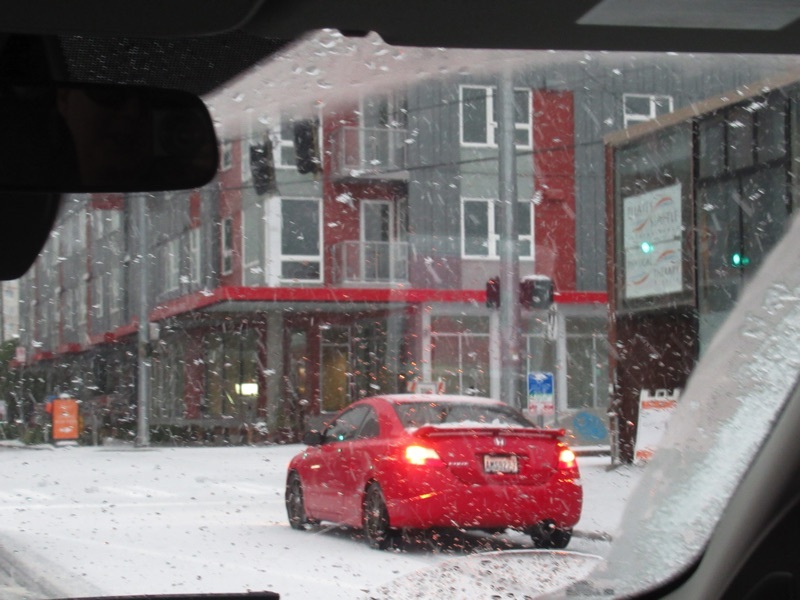 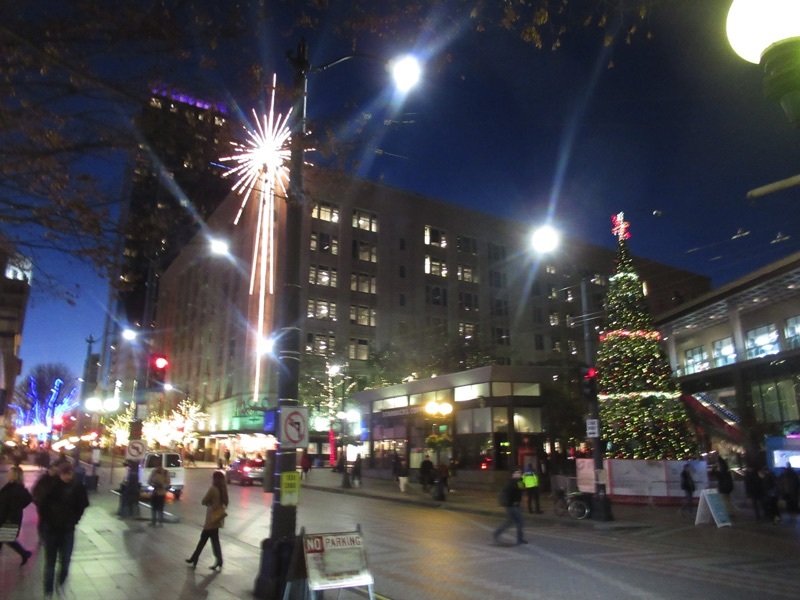 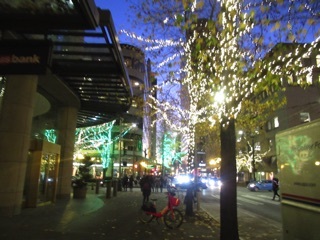 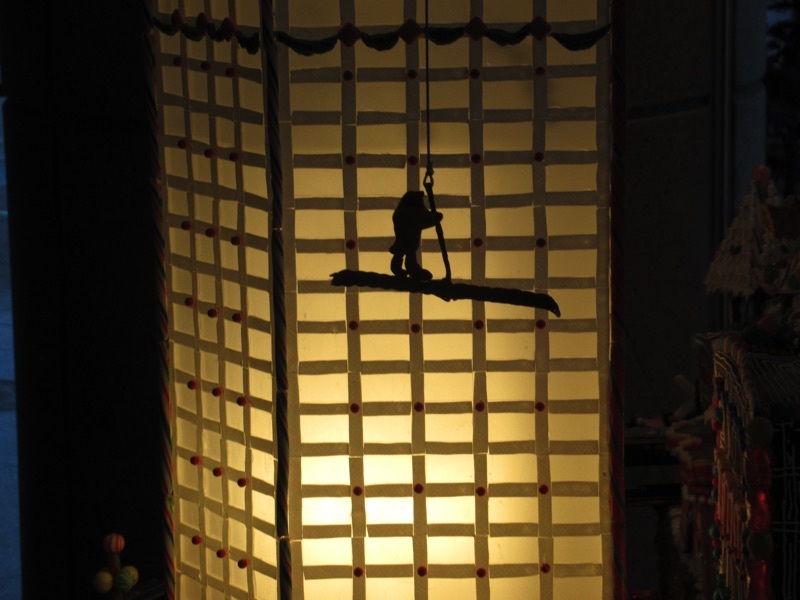 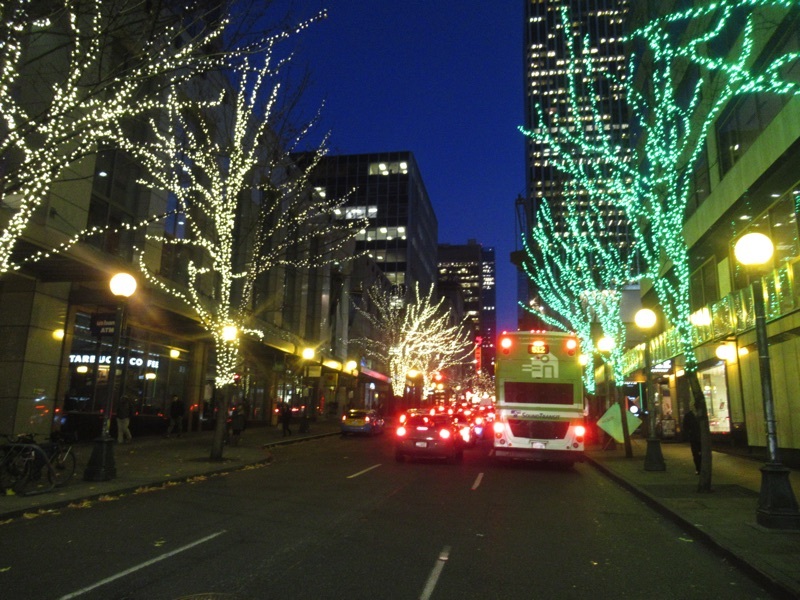 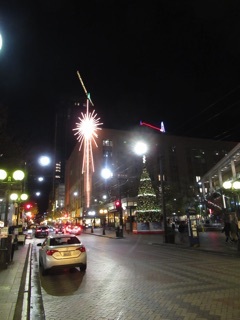 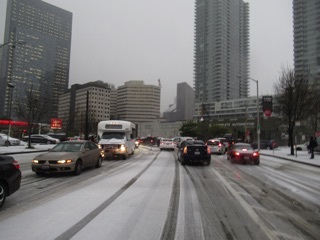 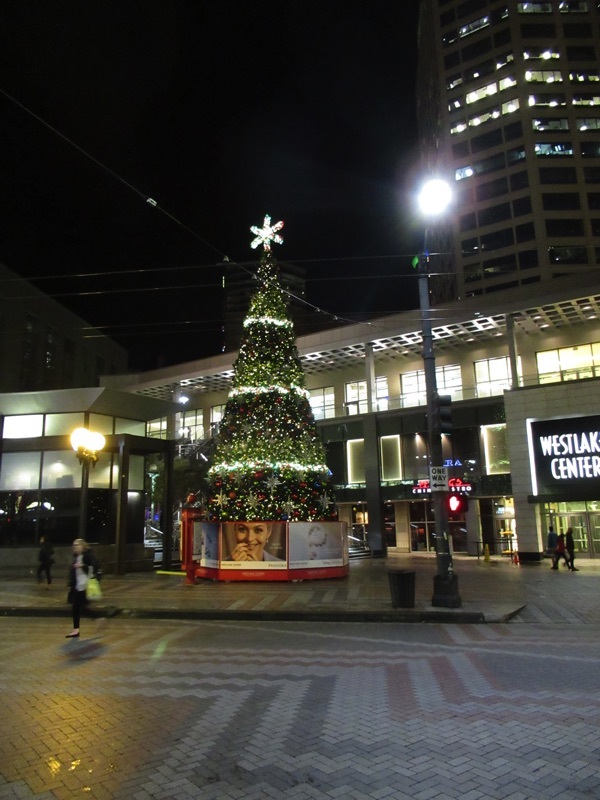 Every Christmas season we head into Seattle for an urban Christmas experience. 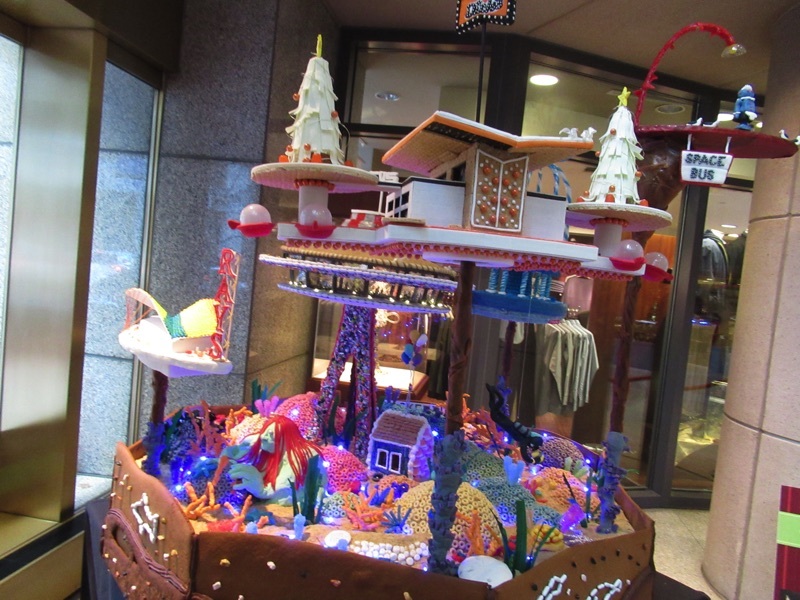 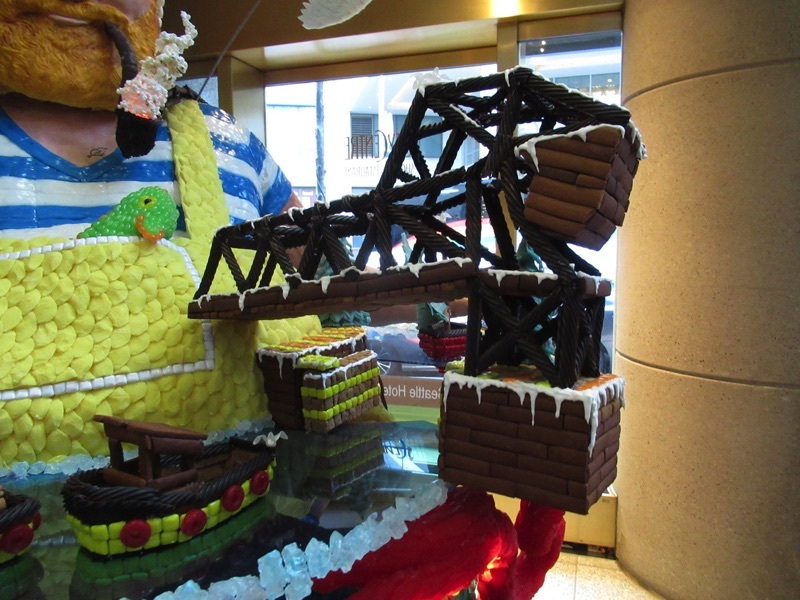 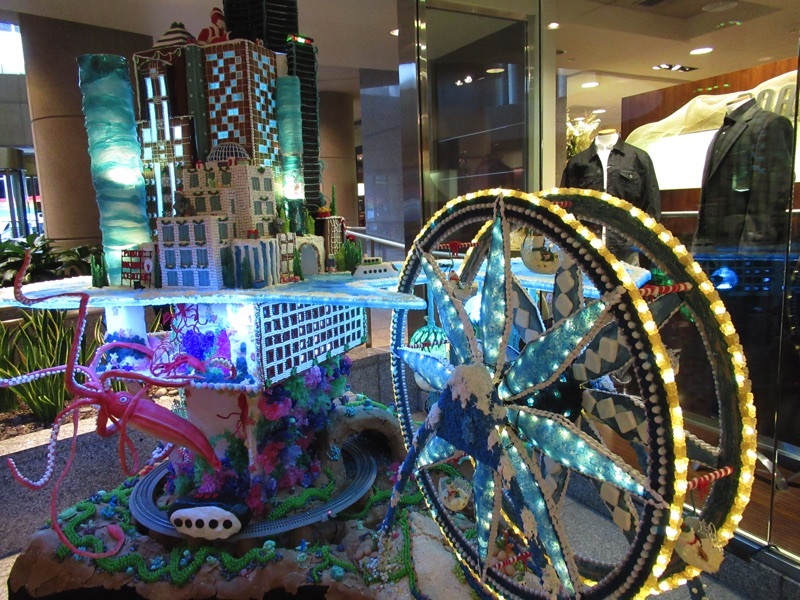 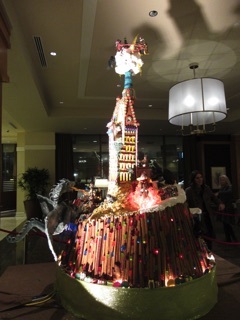 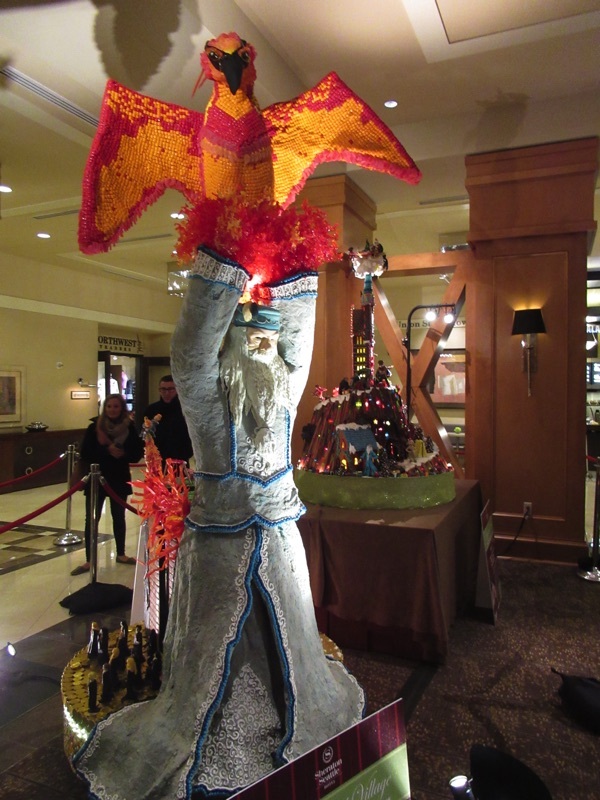 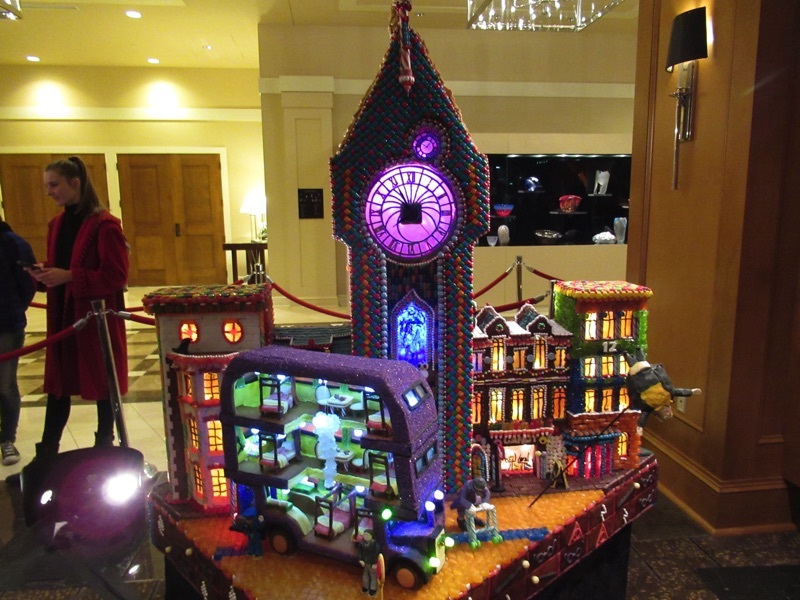 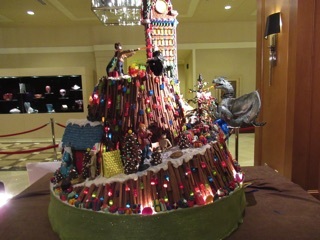 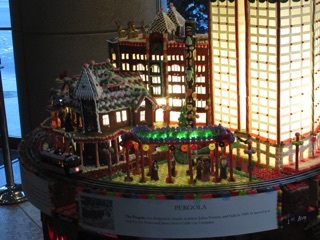 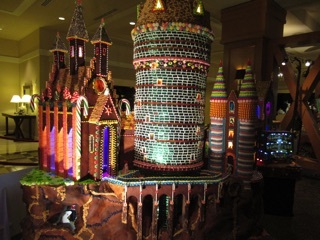 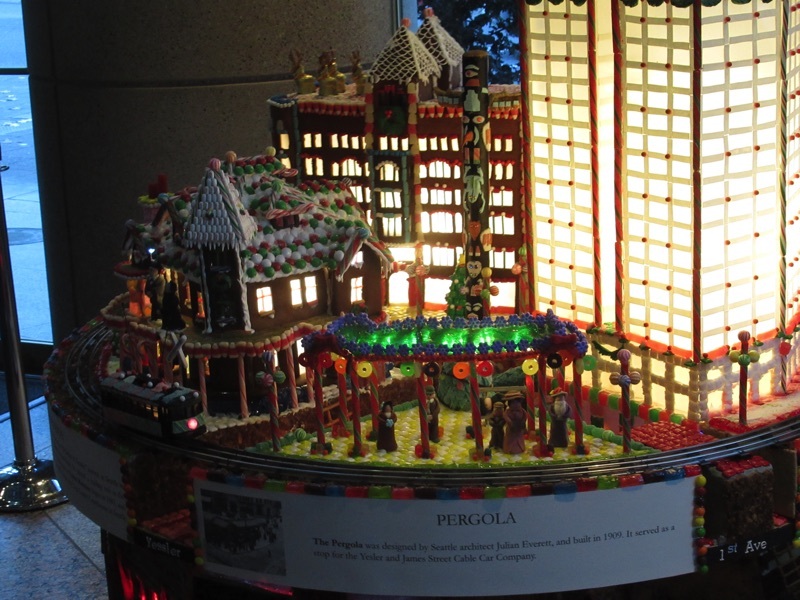 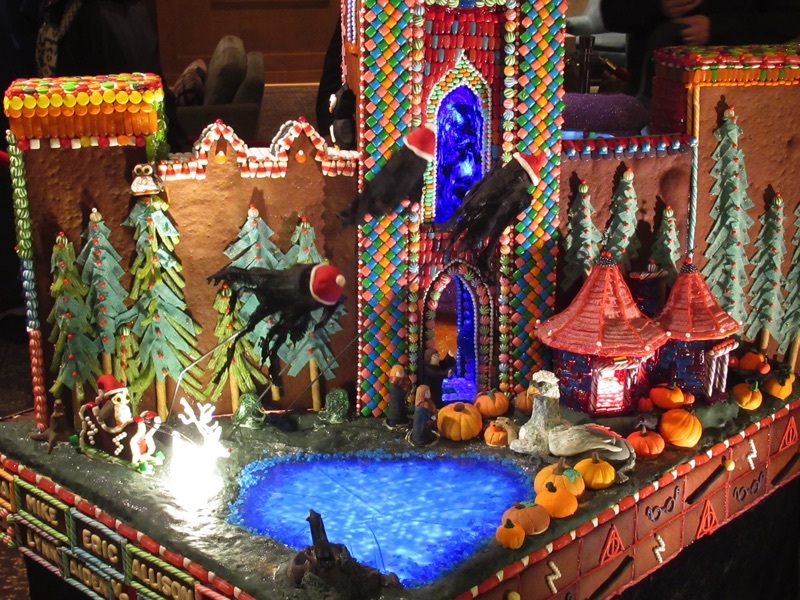 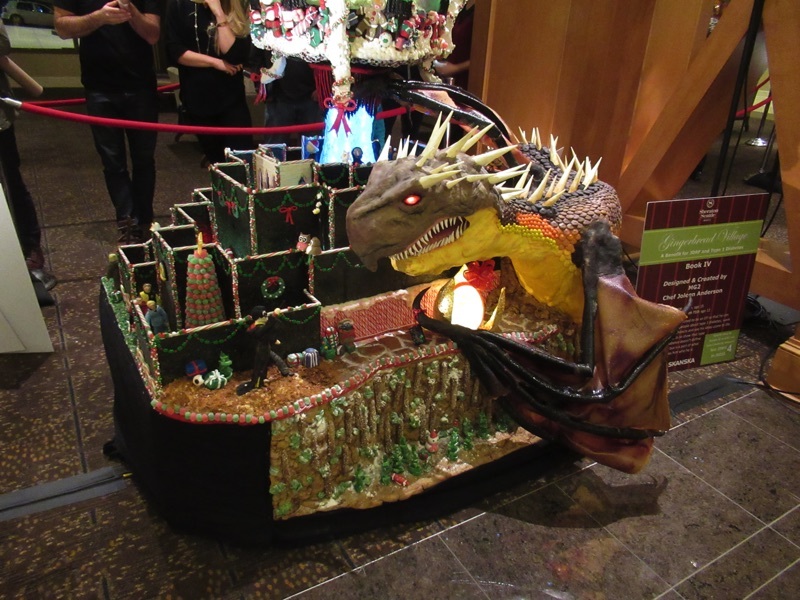 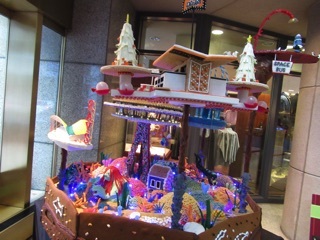 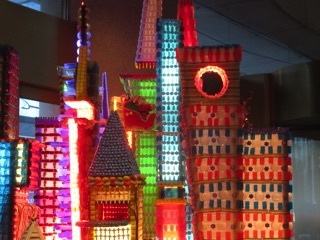 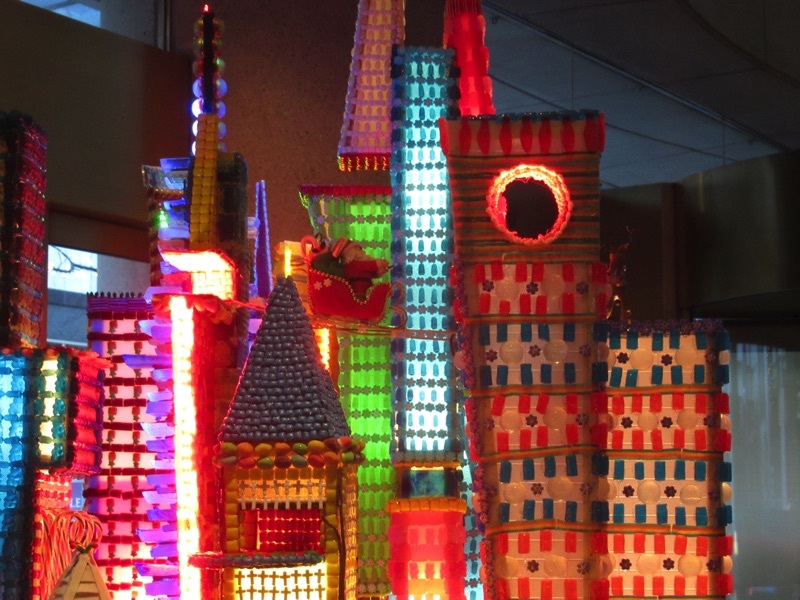 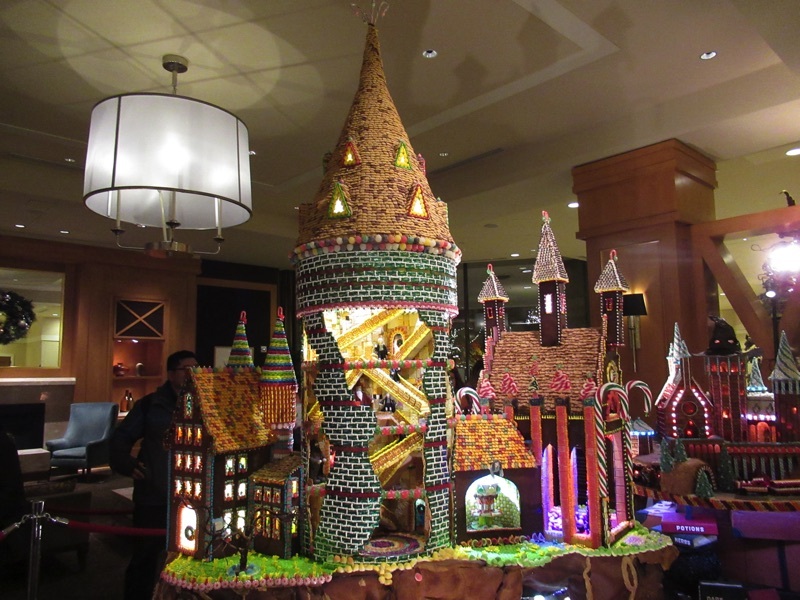 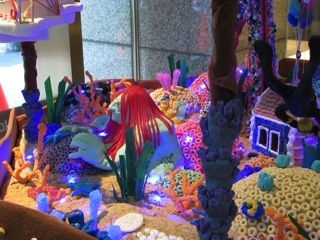 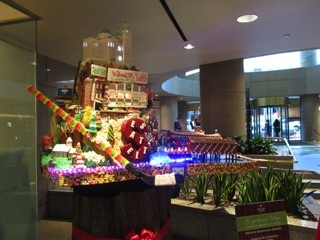 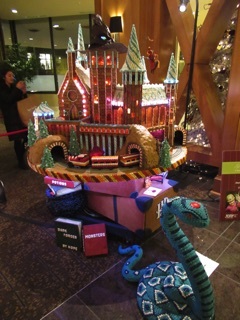 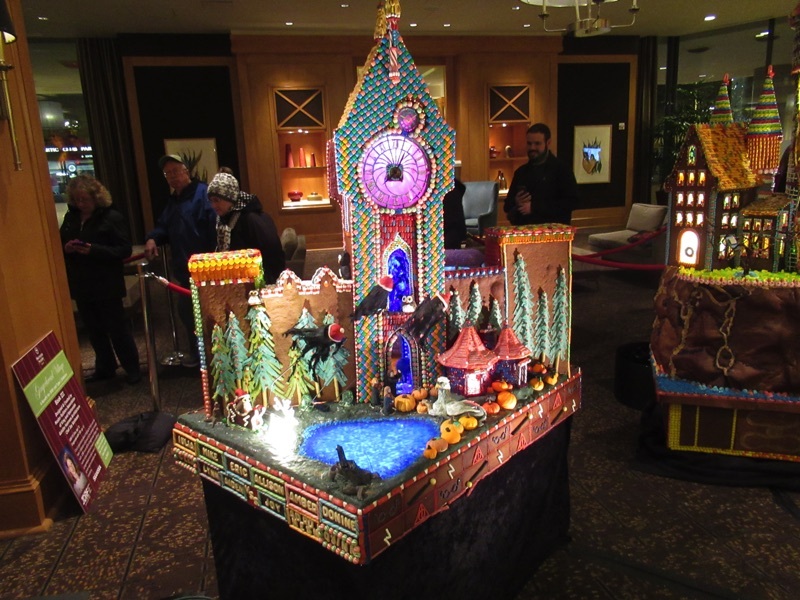 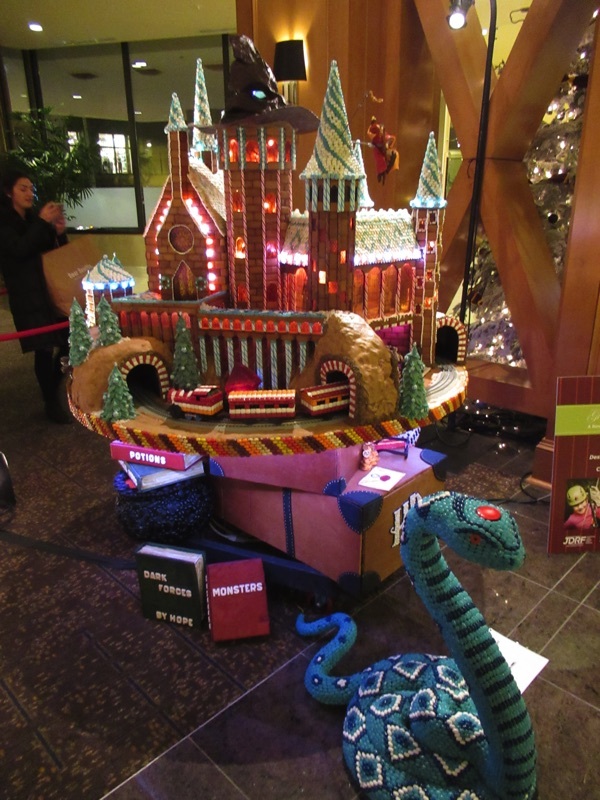 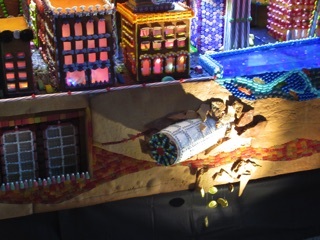 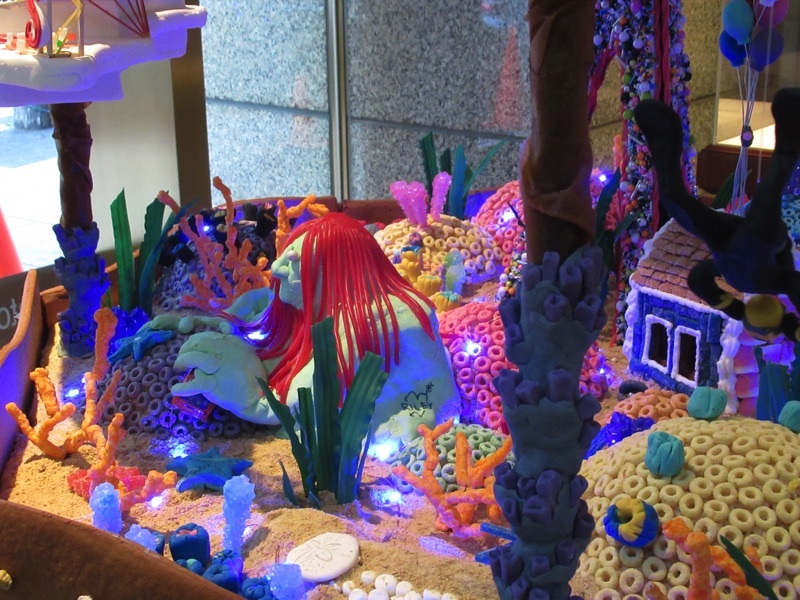 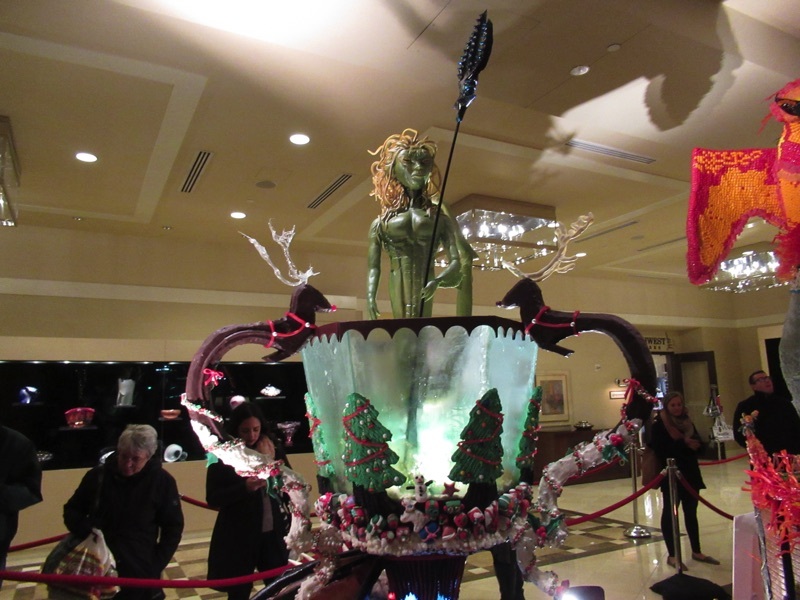 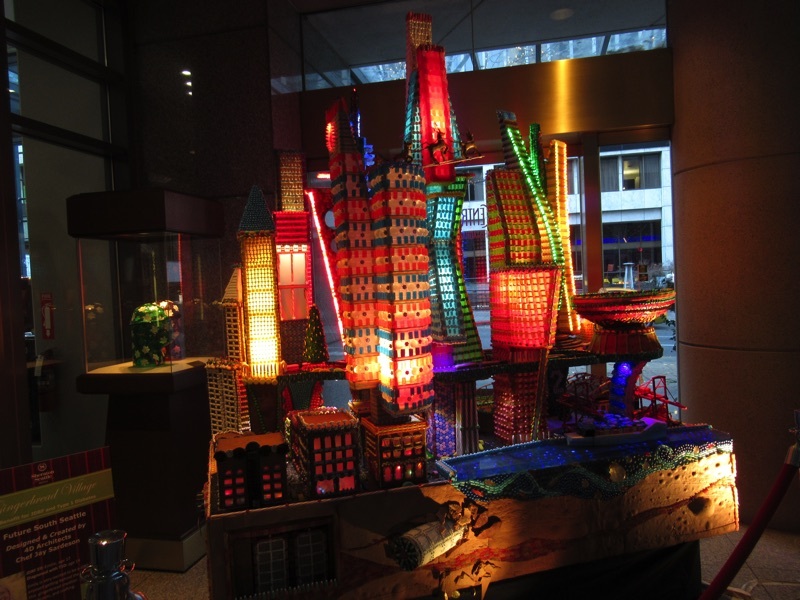 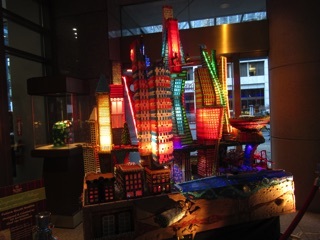 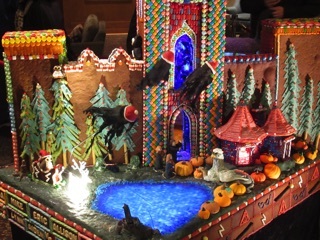 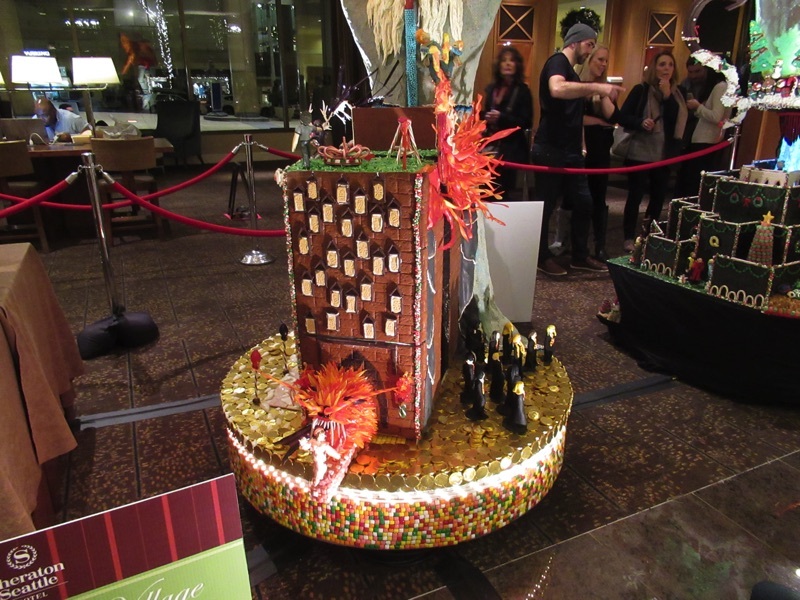 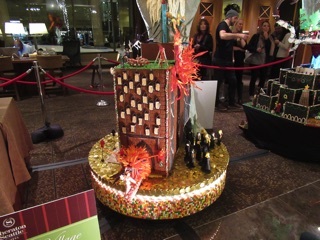 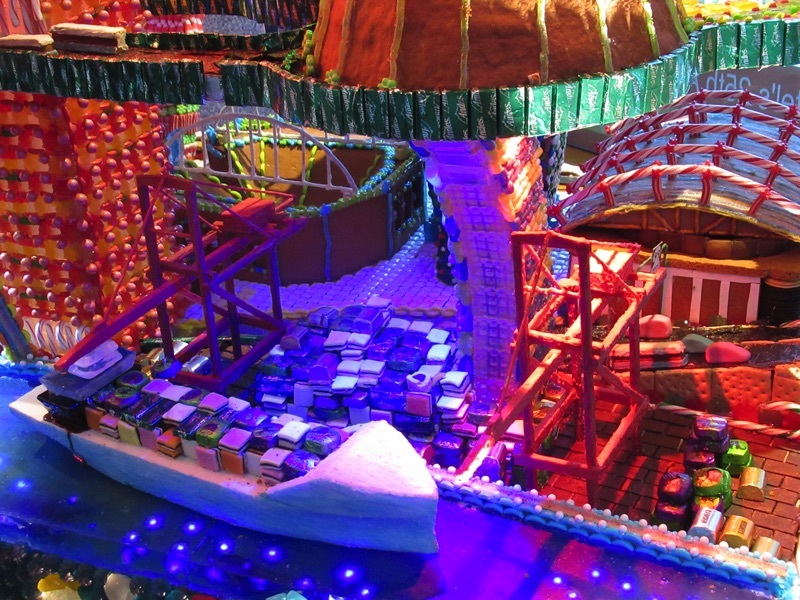 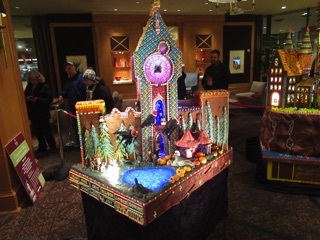 We dropped by the JDRF Christmas Gingerbread Village which was back in the Sheraton lobby this year. 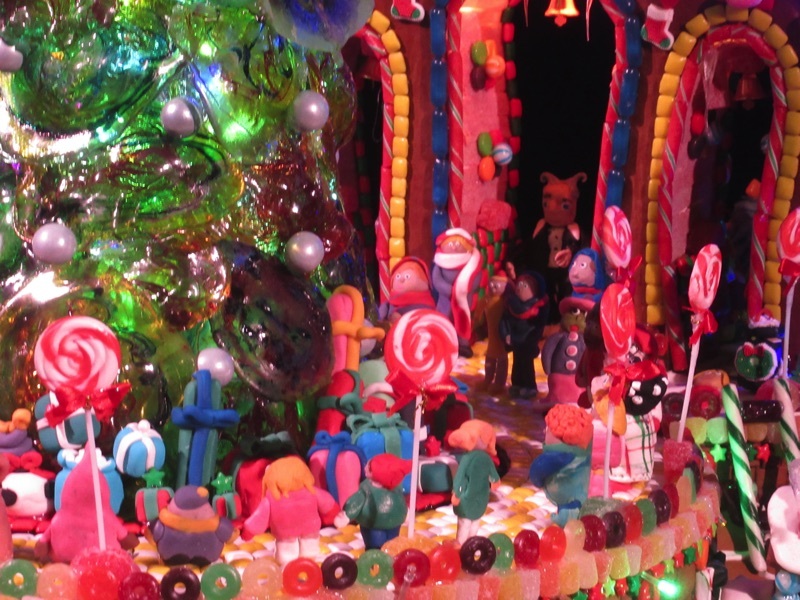 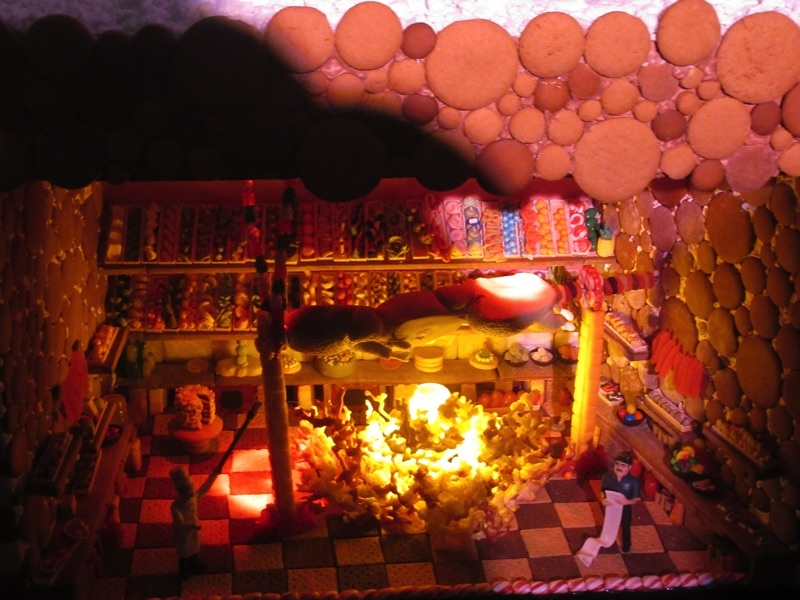 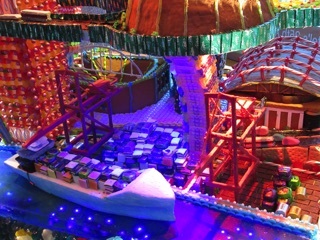 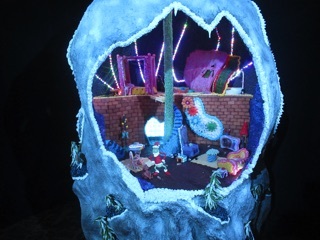 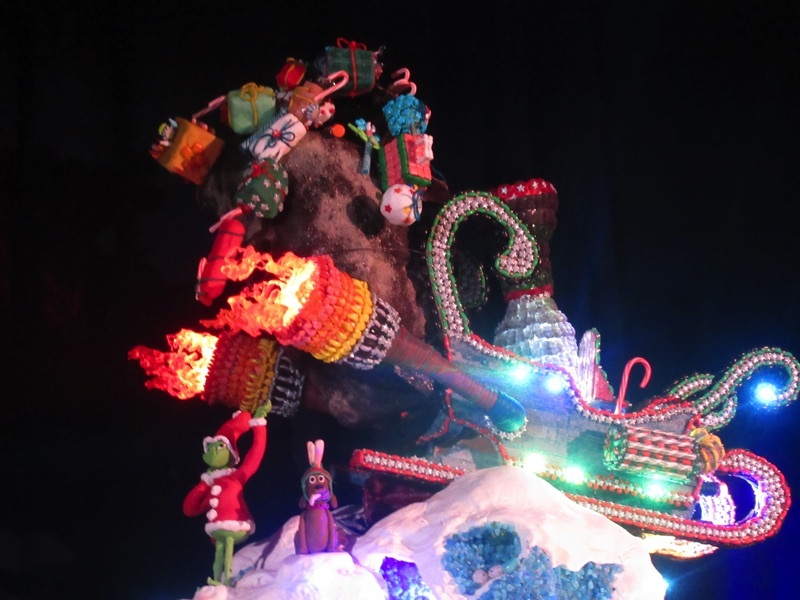 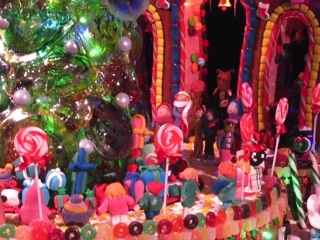 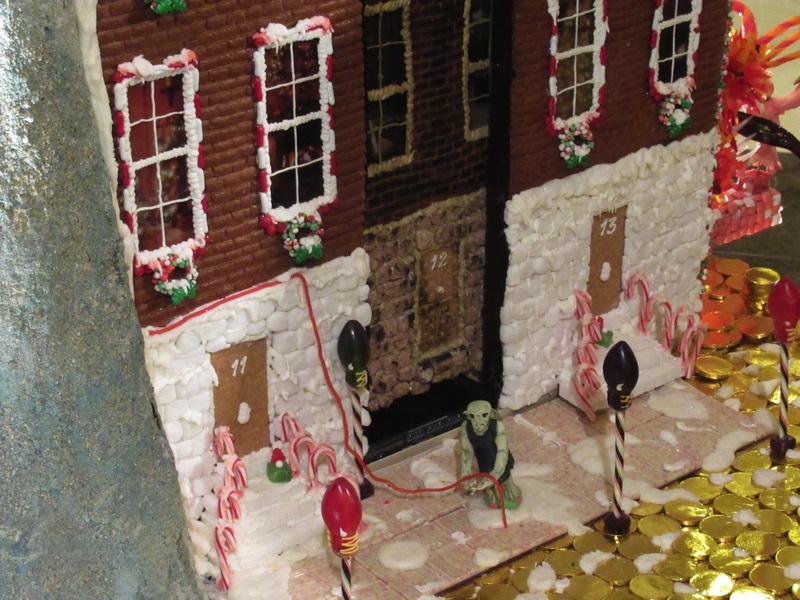 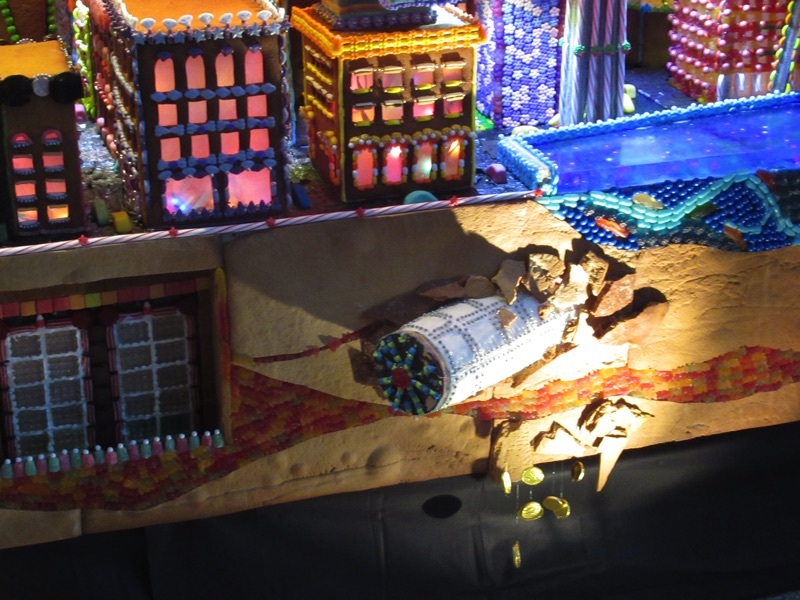 The theme this year was How The Grinch Stole Christmas with scenes from the Dr. Suess book rendered in gingerbread and a variety of candies. 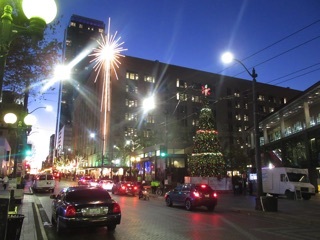 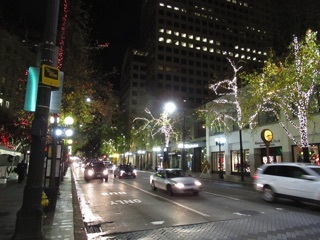 Then we stepped outside to enjoy the downtown Christmas lights. 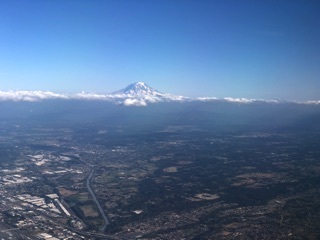 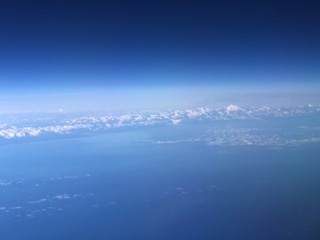 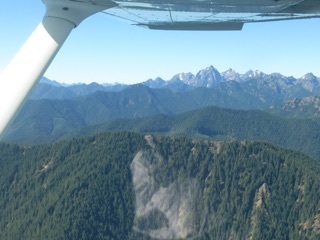 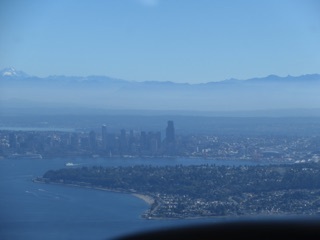 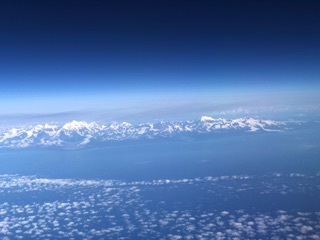 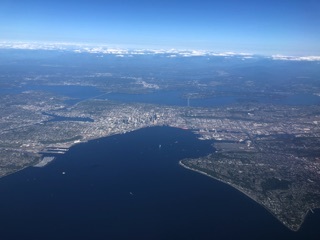 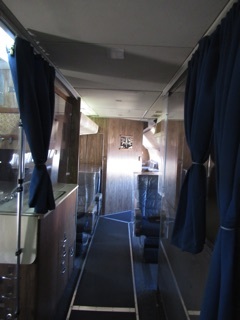 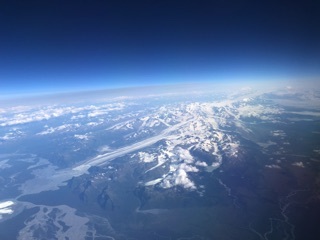 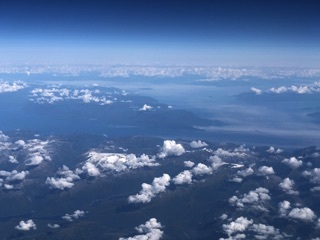 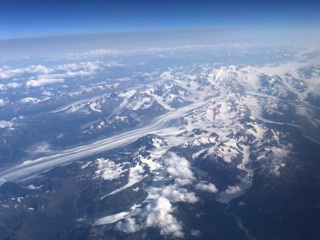 We had great seats on the flight from Anchorage to Seattle. 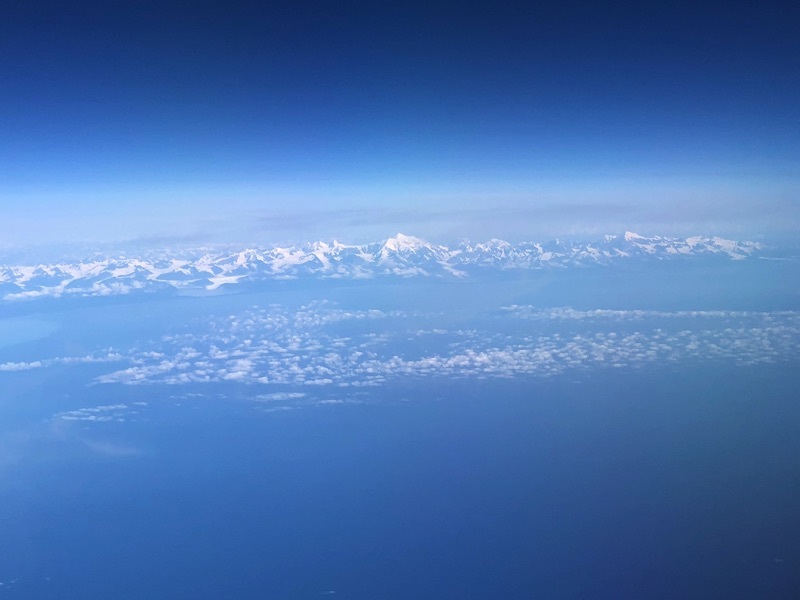 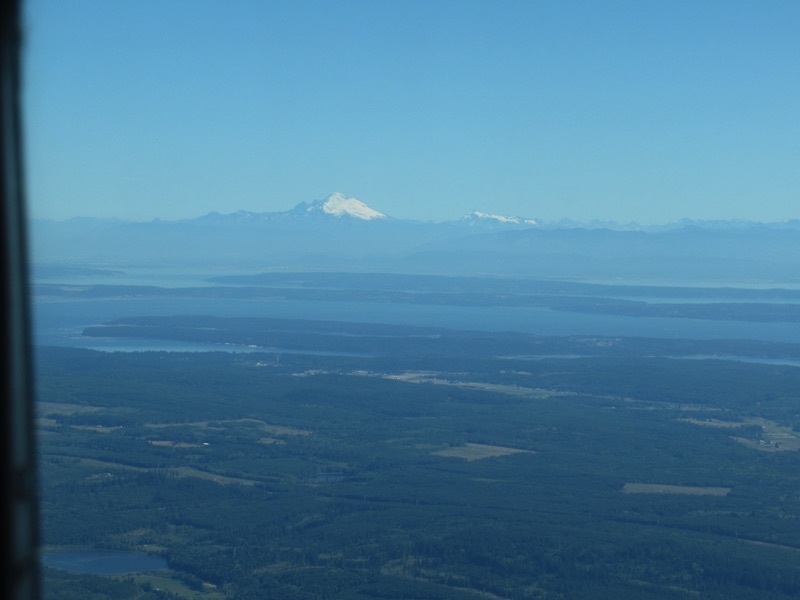 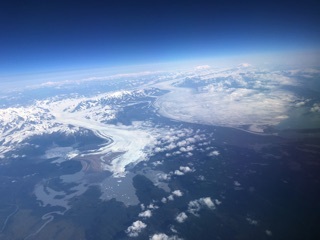 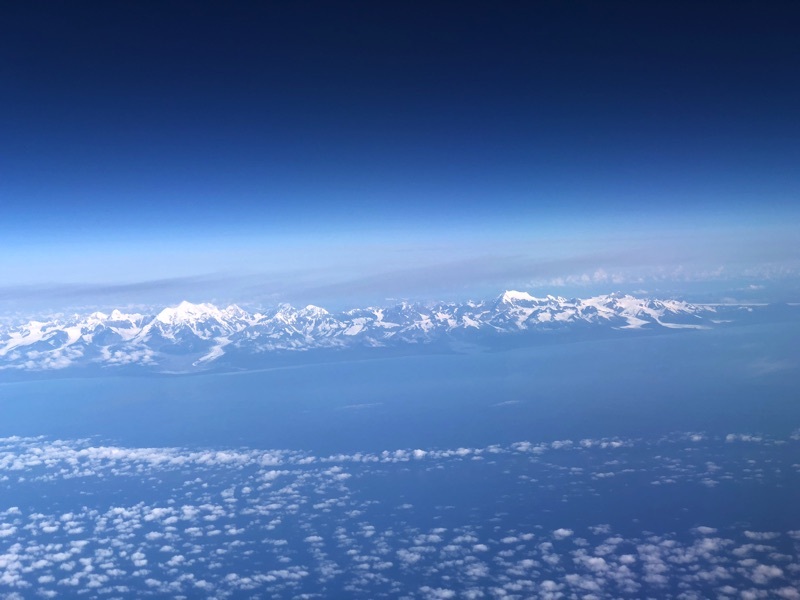 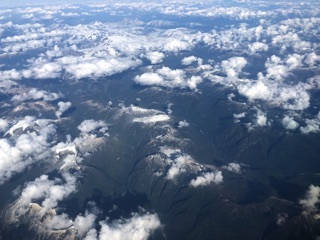 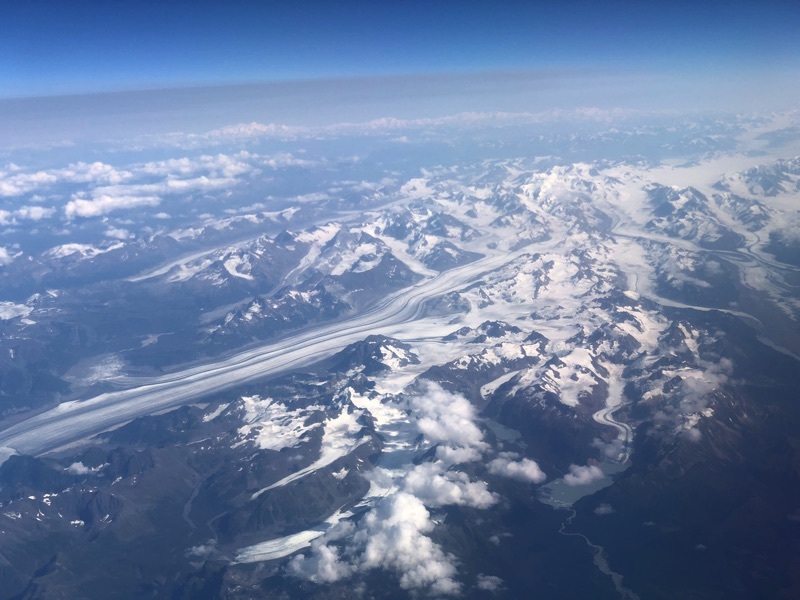 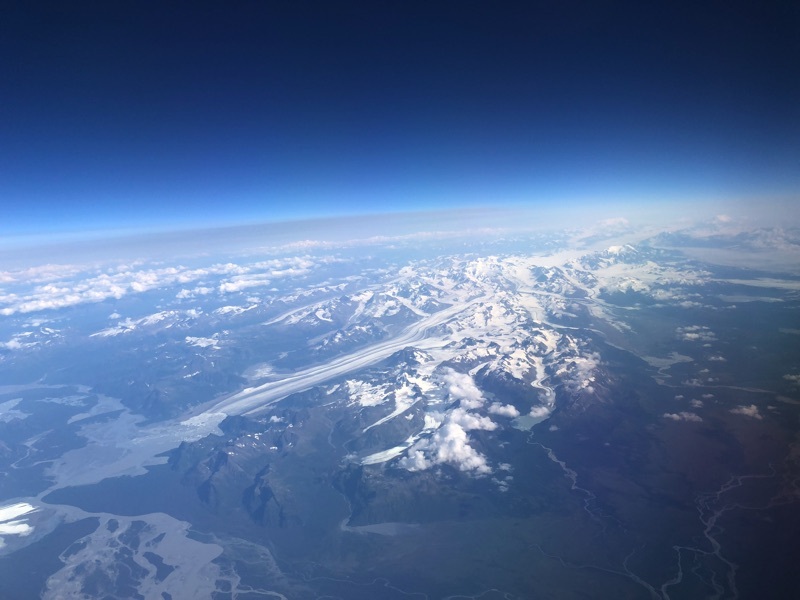 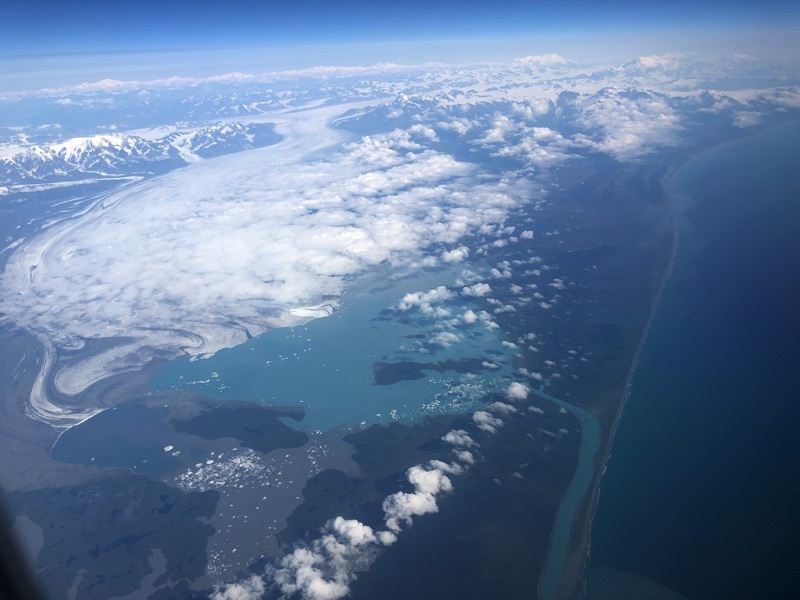 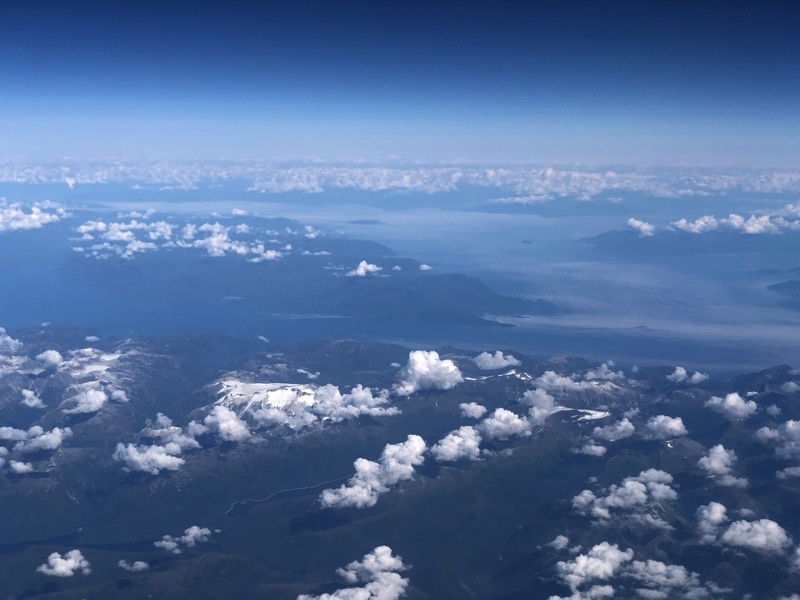 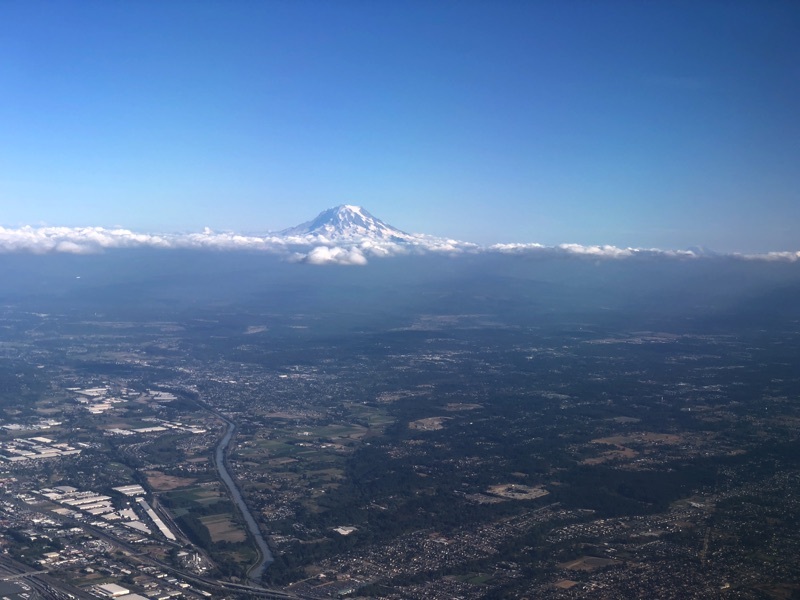 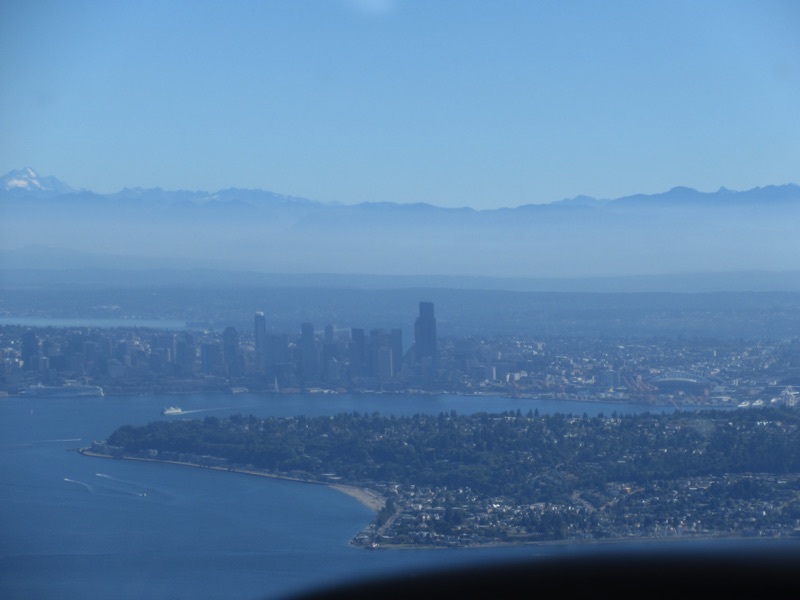 Here are some photos, including some of the glaciers in Wrangell-St. Elias National Park, some mountains and coastline and then our approach to Seattle. 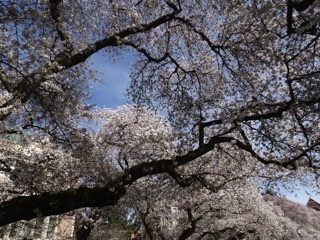 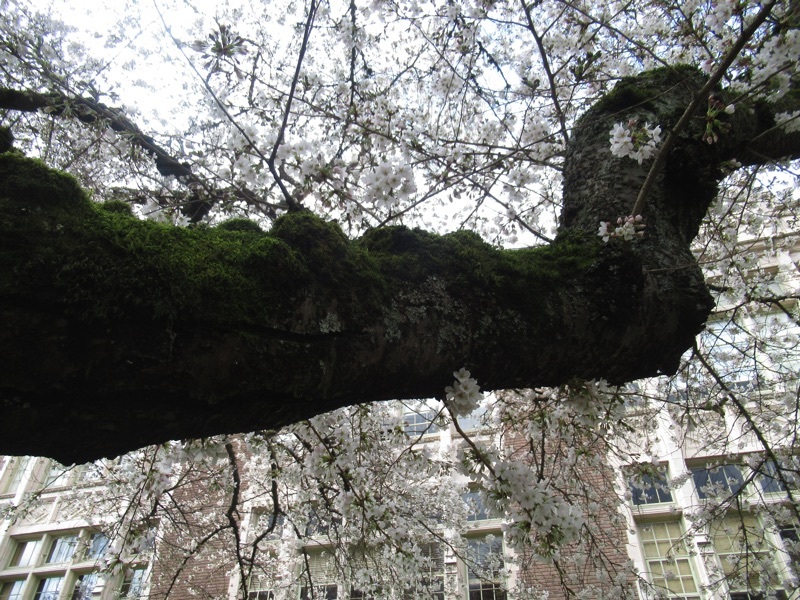 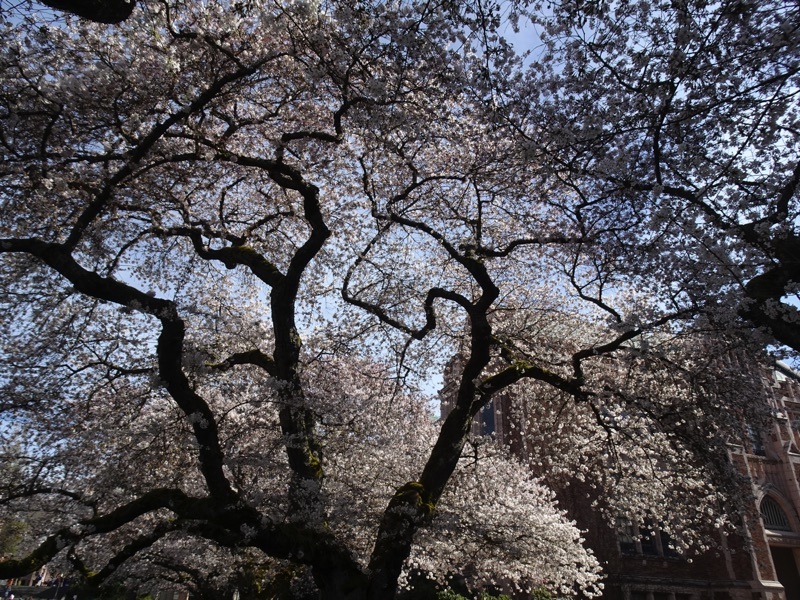 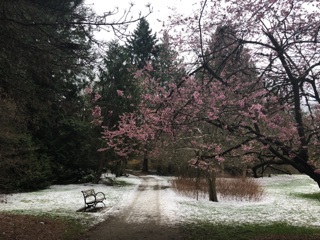 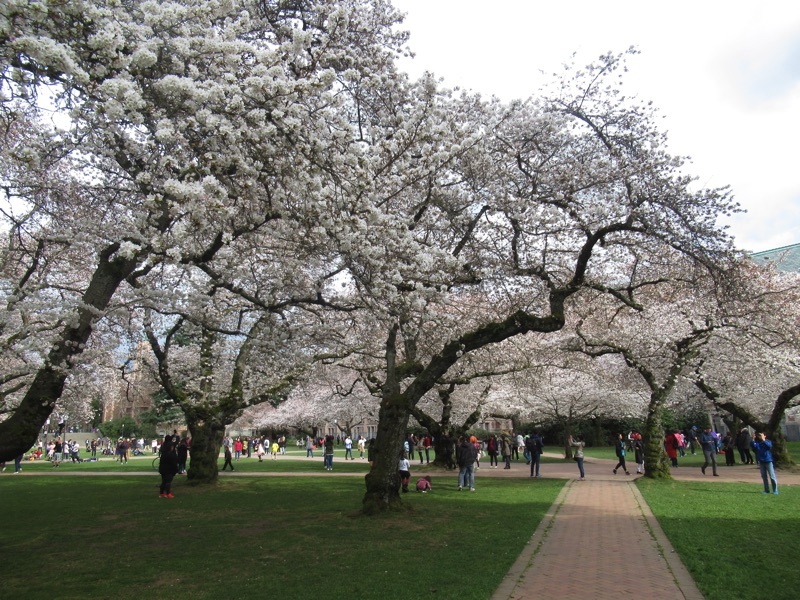 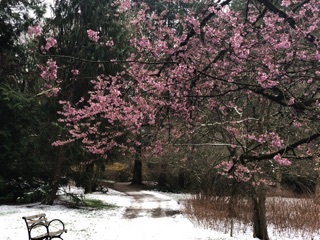 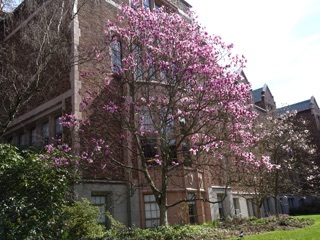 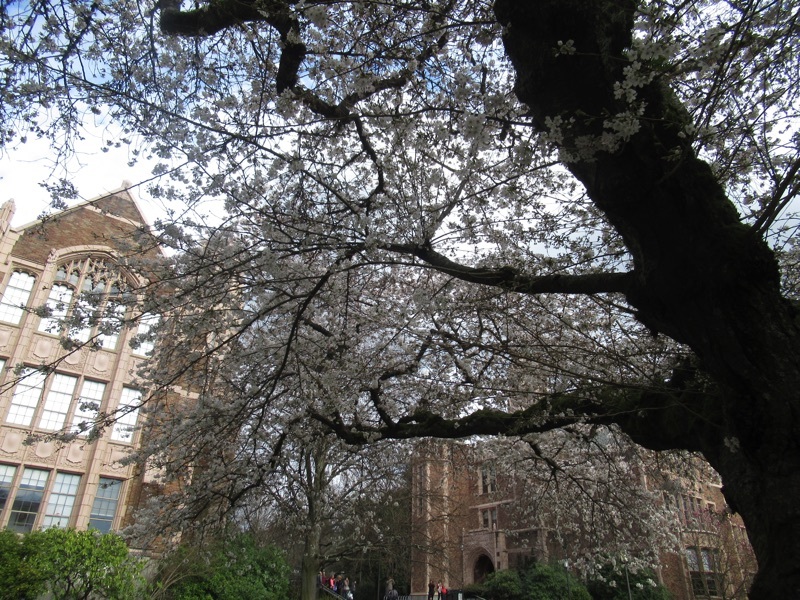 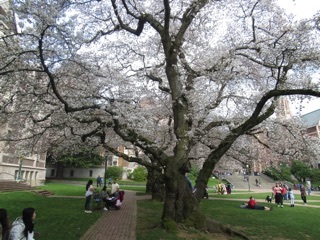 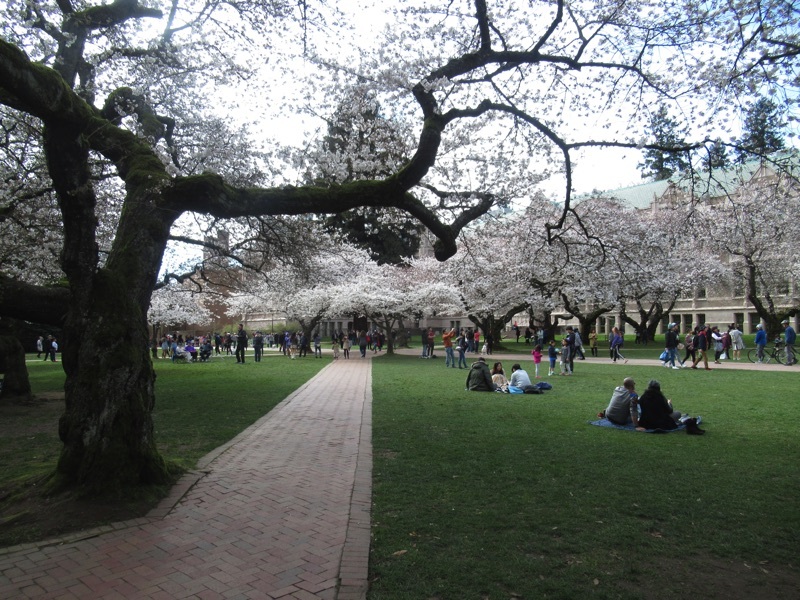 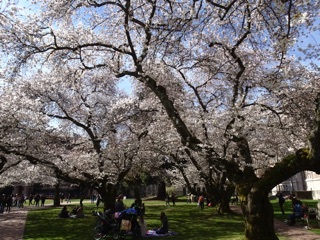 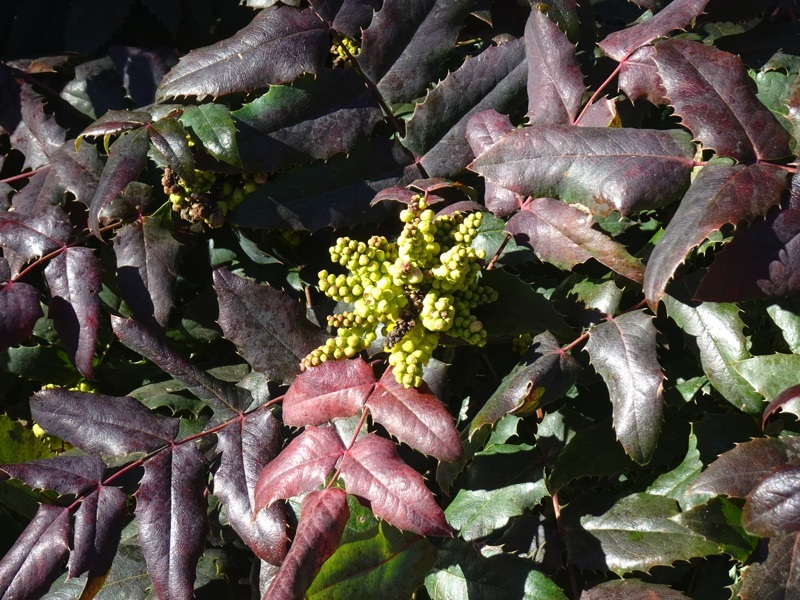 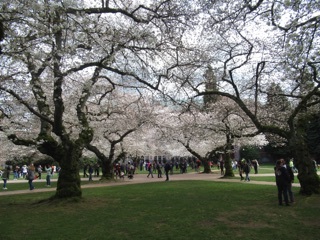 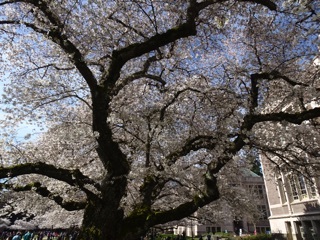 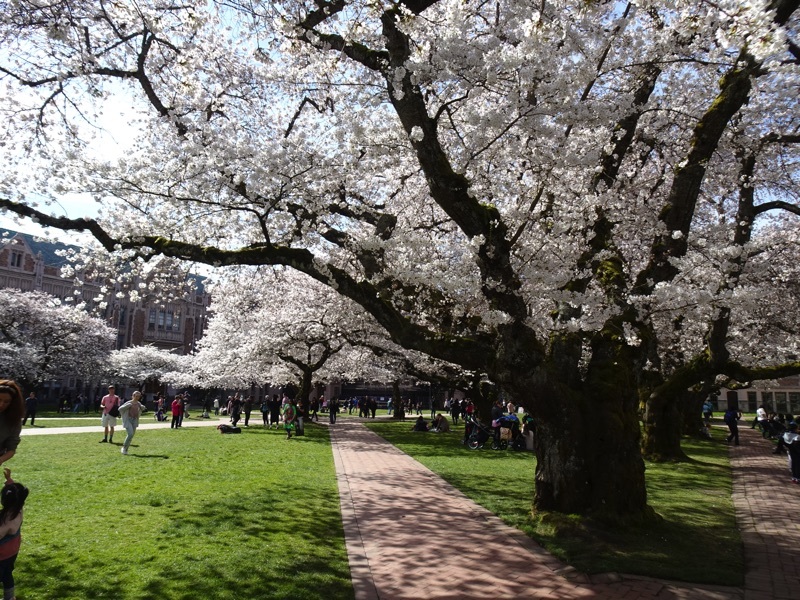 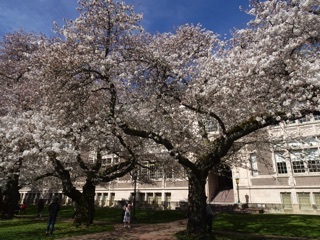 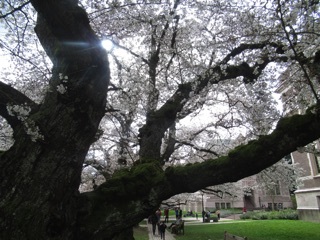 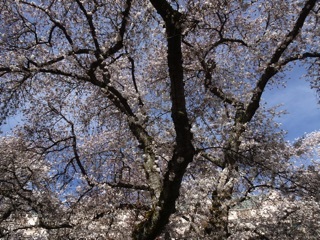 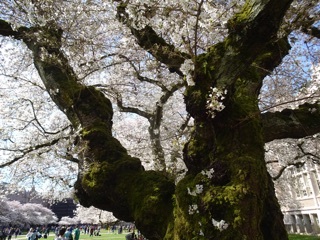 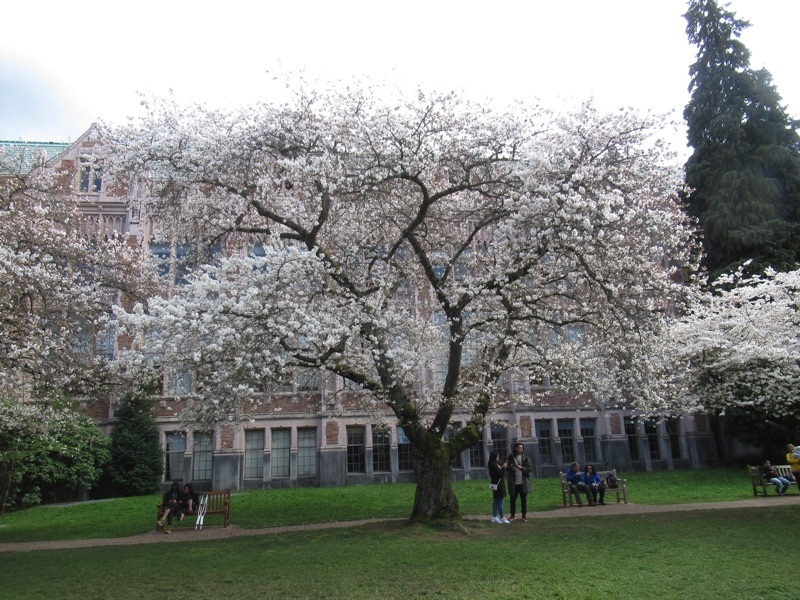 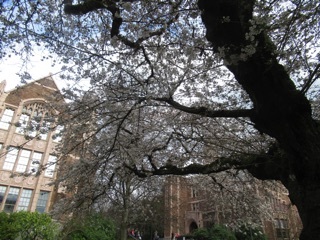 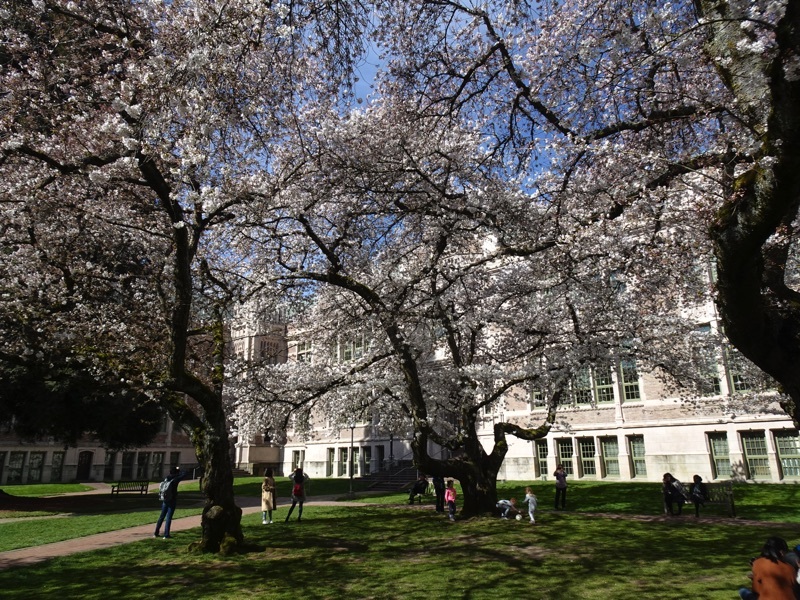 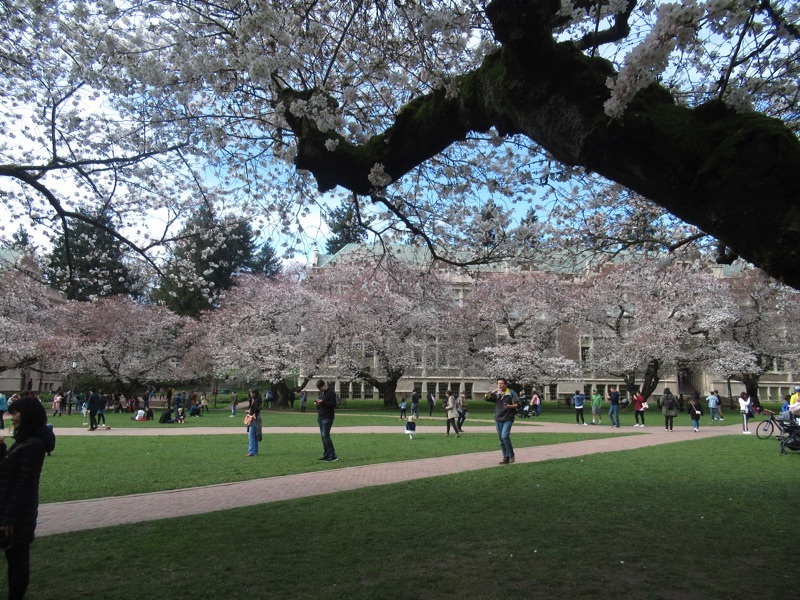 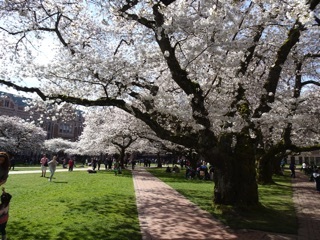 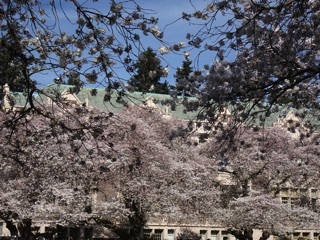 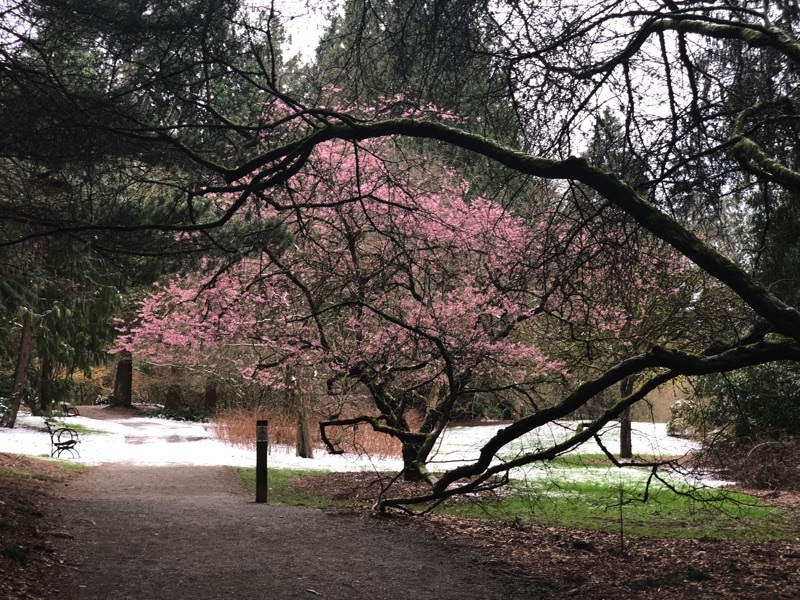 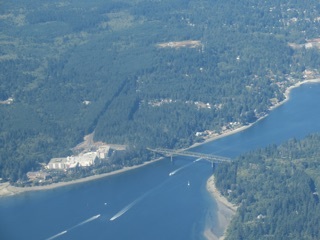 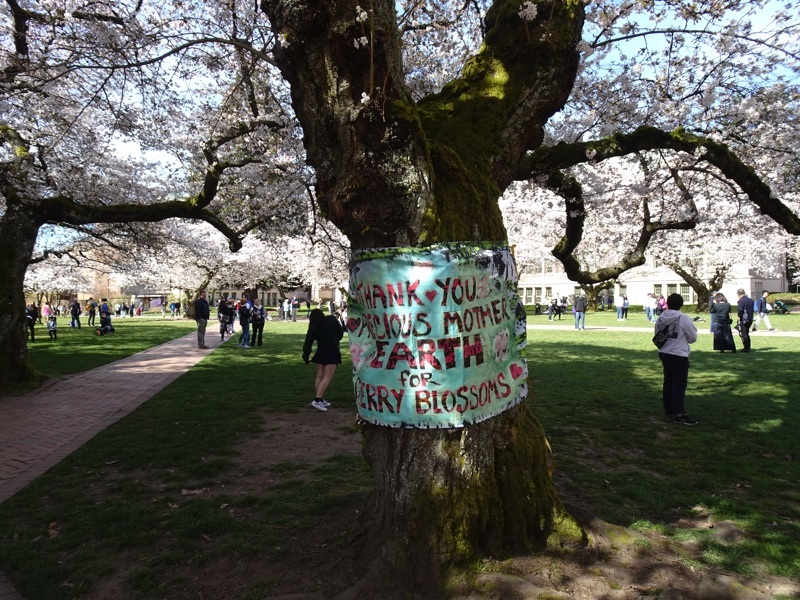 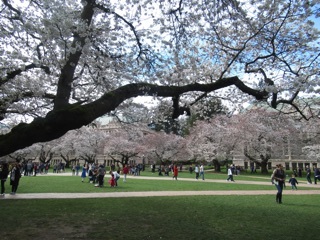 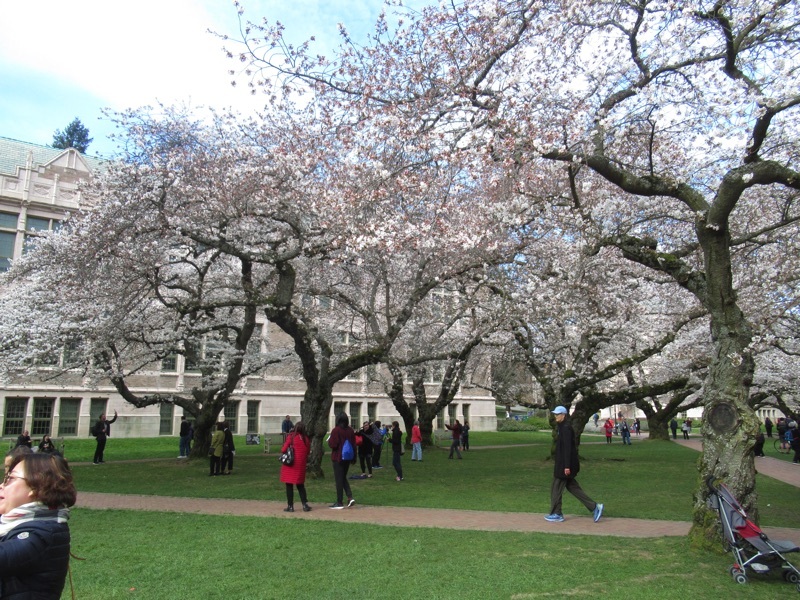 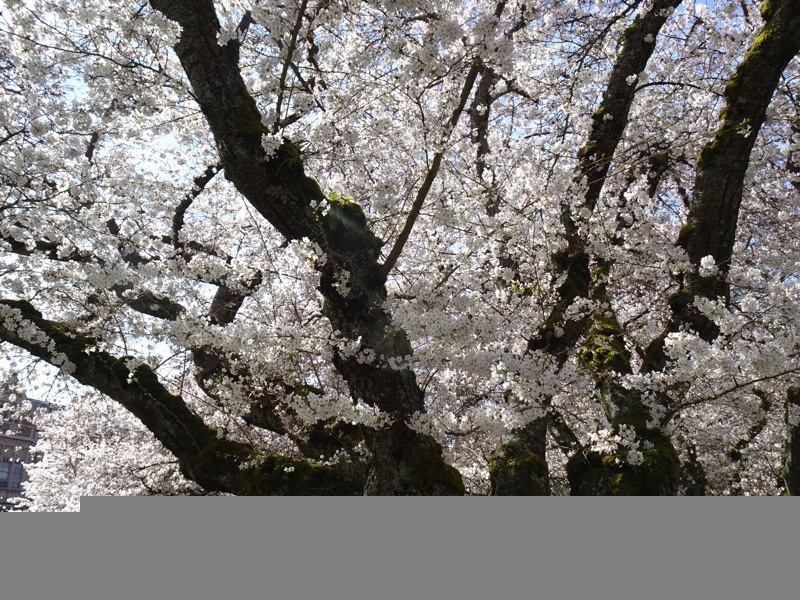 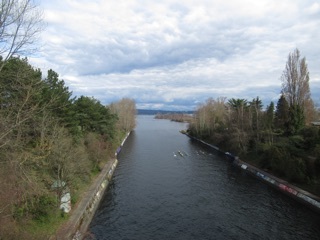 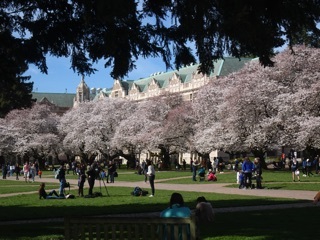 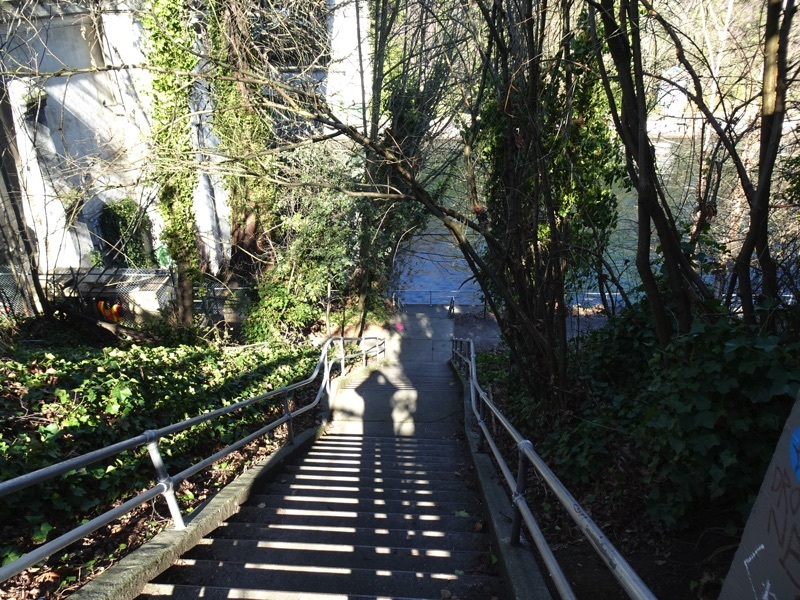 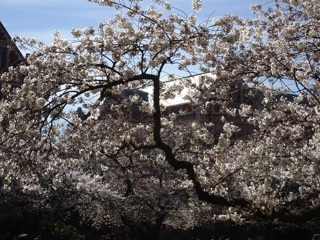 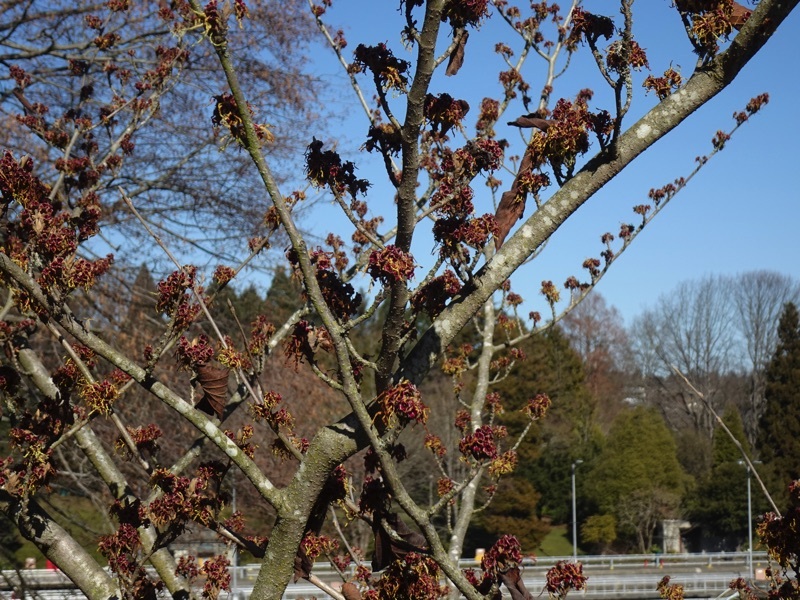 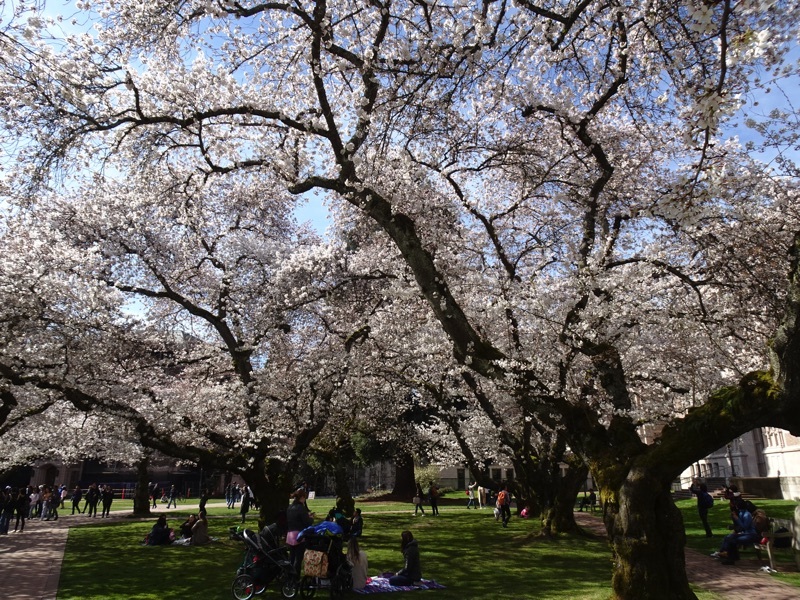 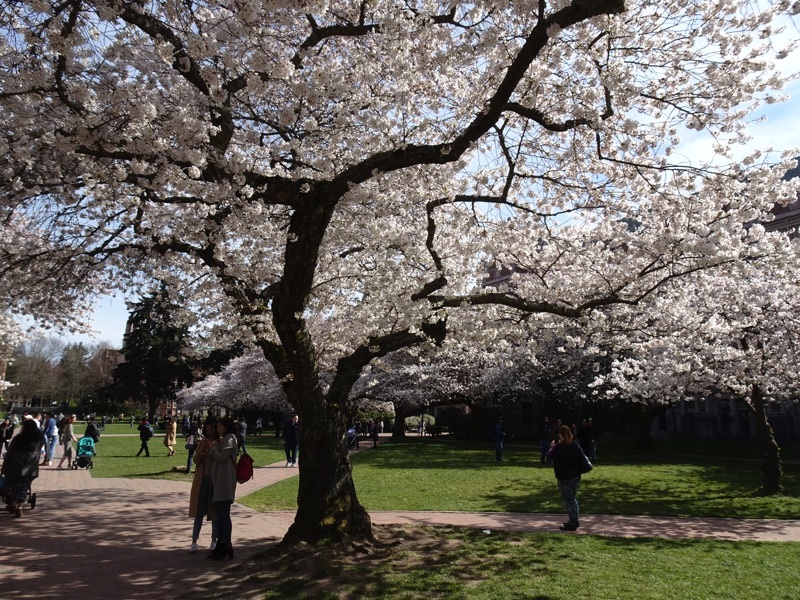 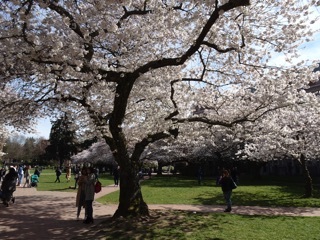 After admiring the cherry trees in the University of Washington quad, we headed south across the Montlake Cut. 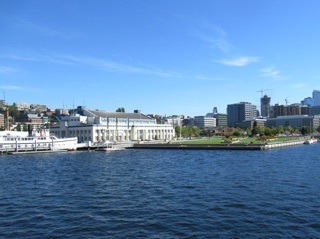 We descended to the waterfront and headed east towards Foster Island. 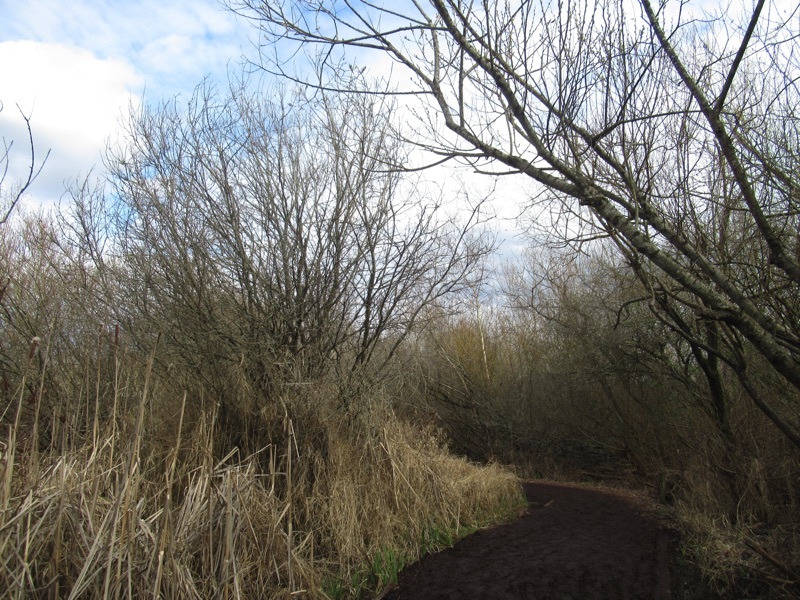 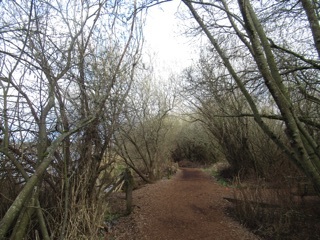 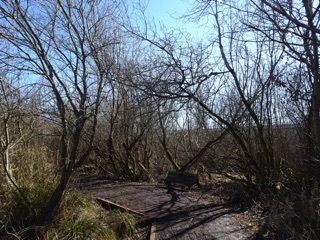 First, we took a foot bridge to Marsh Island which true to its name was marshy and muddy. 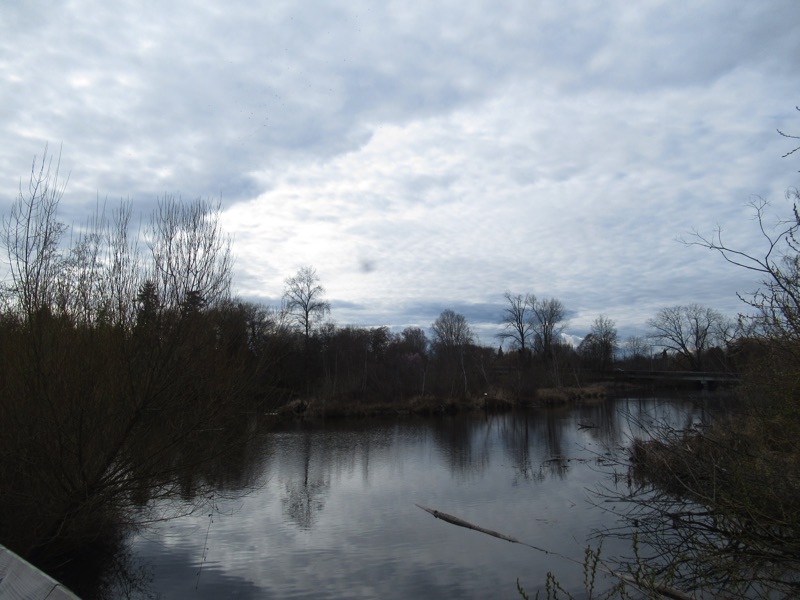 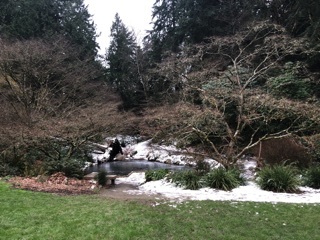 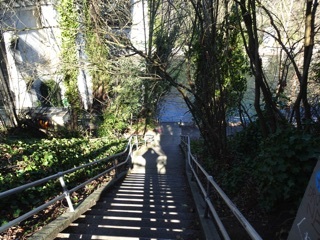 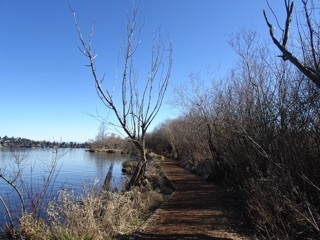 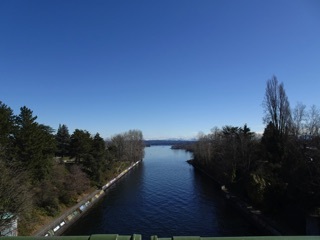 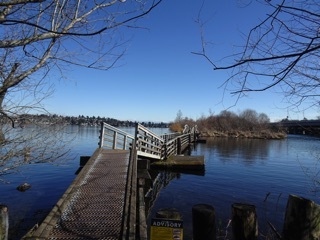 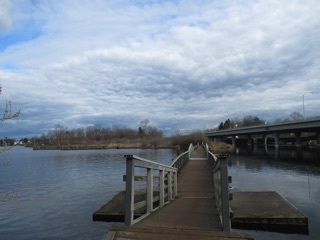 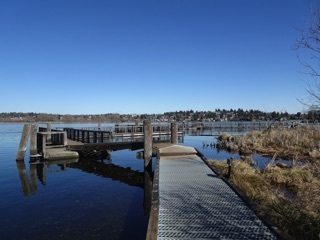 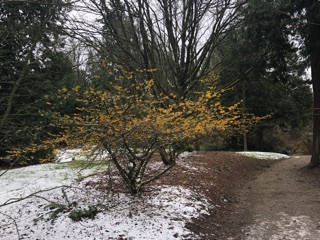 Then, we crossed another, longer foot bridge and then followed a causeway with wonderful views of the university, the Cascades and Lake Washington. 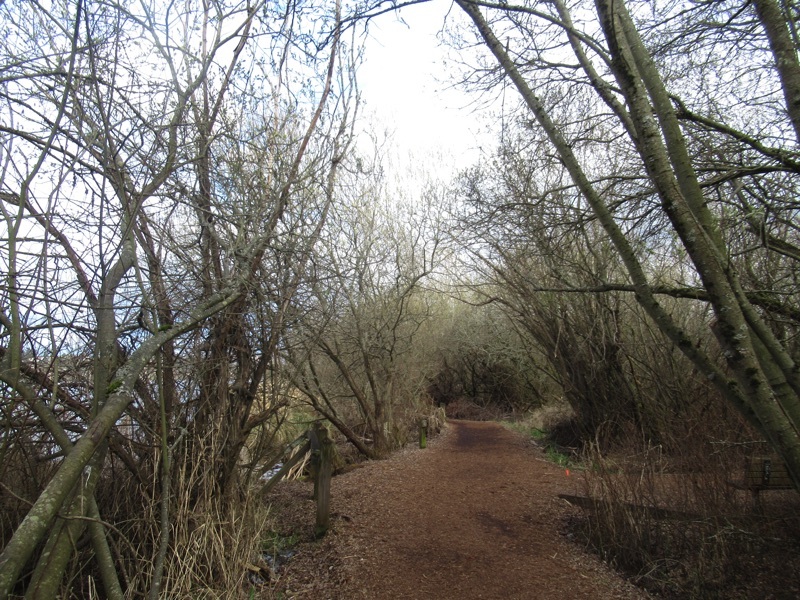 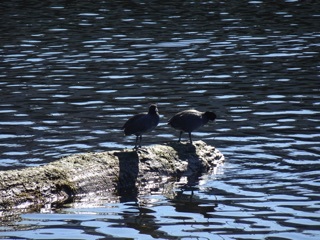 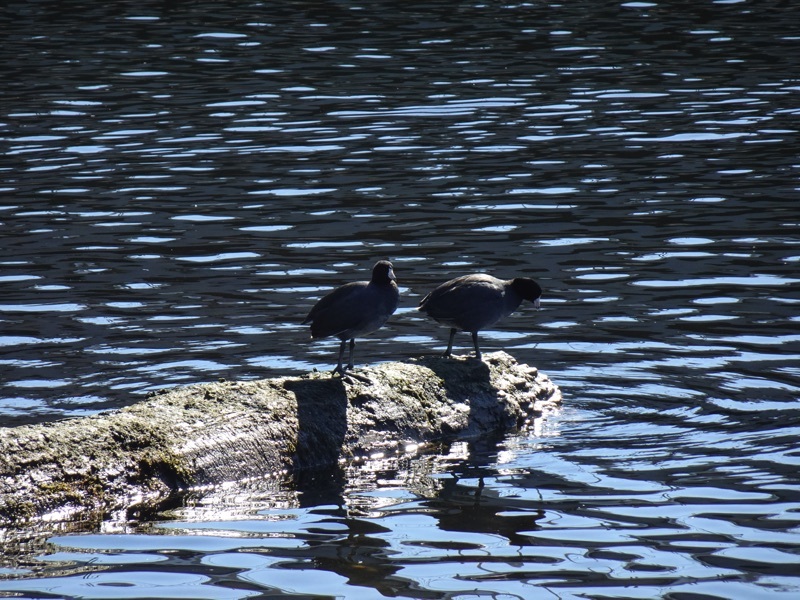 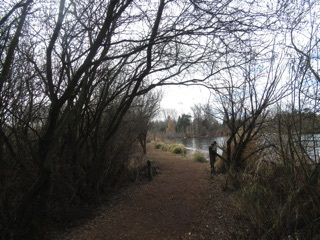 We followed the trail across Foster Island, then headed south towards the Arboretum and back to civilization. 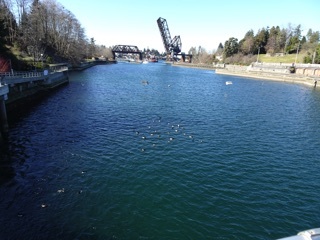 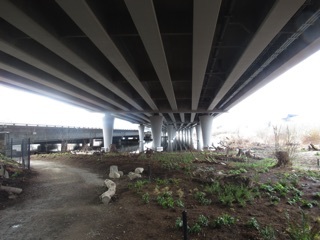 That's 520 overhead; there were ducks below. 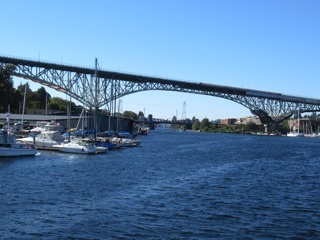 If you’ve visited this site a few times you know we are big fans of the Ballard Locks We took the Argosy Cruise from South Lake Union through the locks to Pier 55 in the harbor. 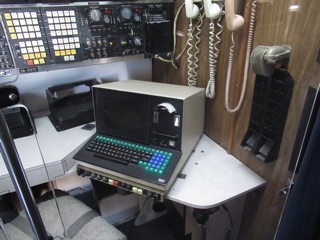 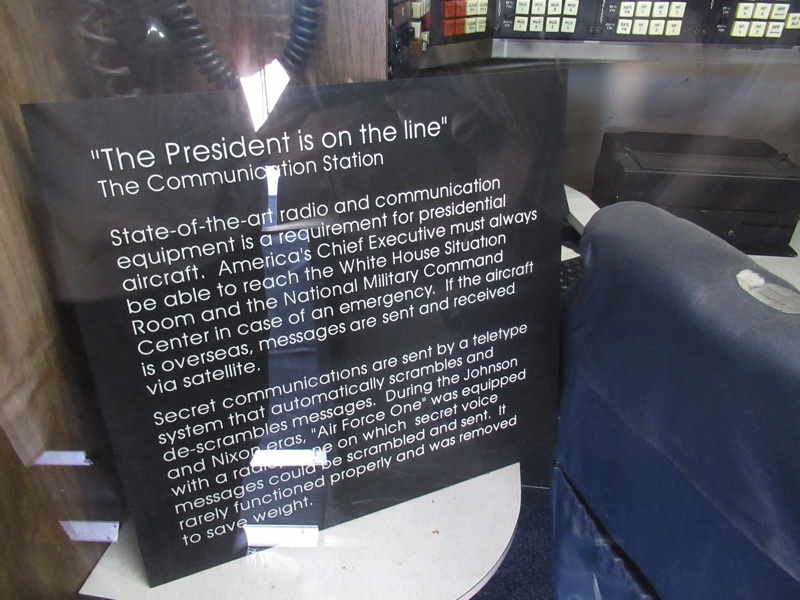 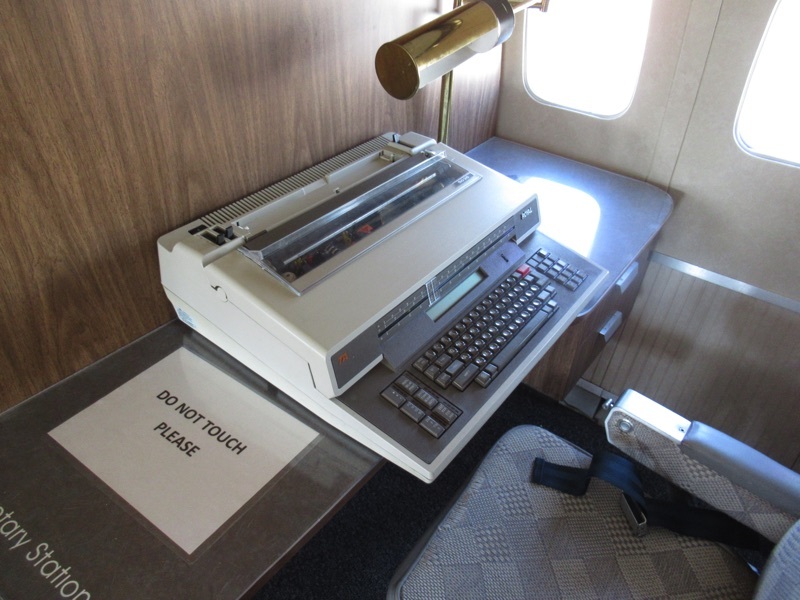 It was fascinating, since we were already familiar with the route as seen from land. 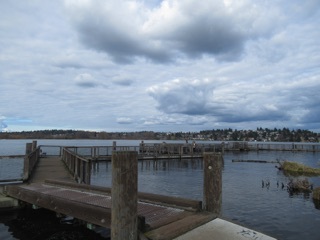 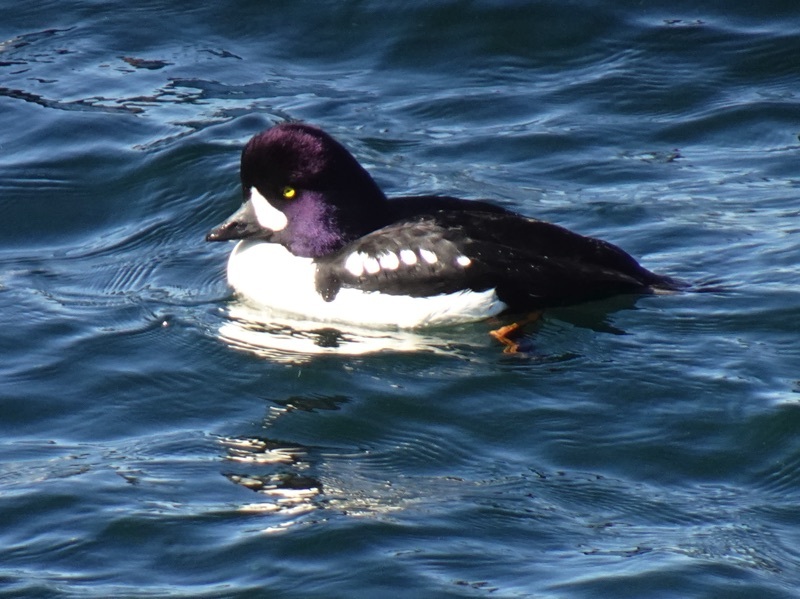 This time we were seeing everything from the water side, and a lot more was visible. 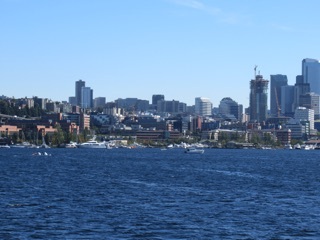 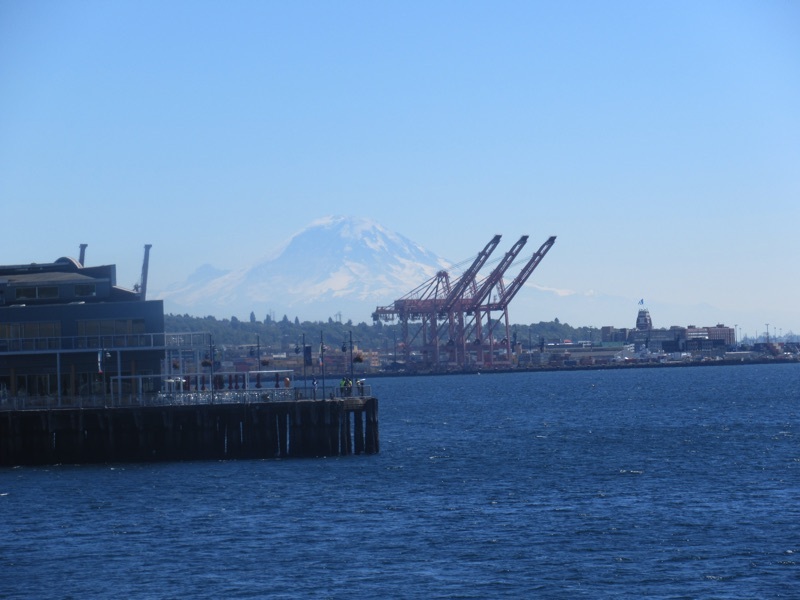 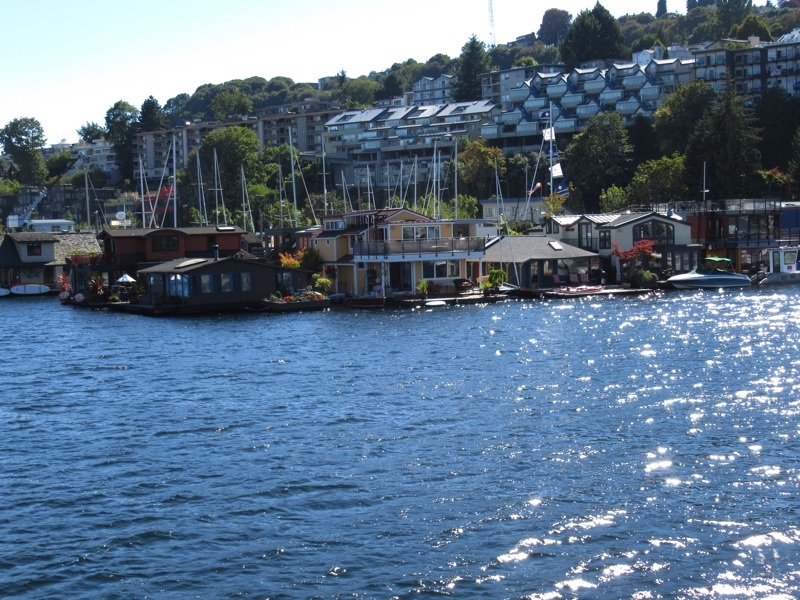 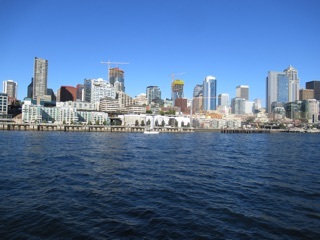 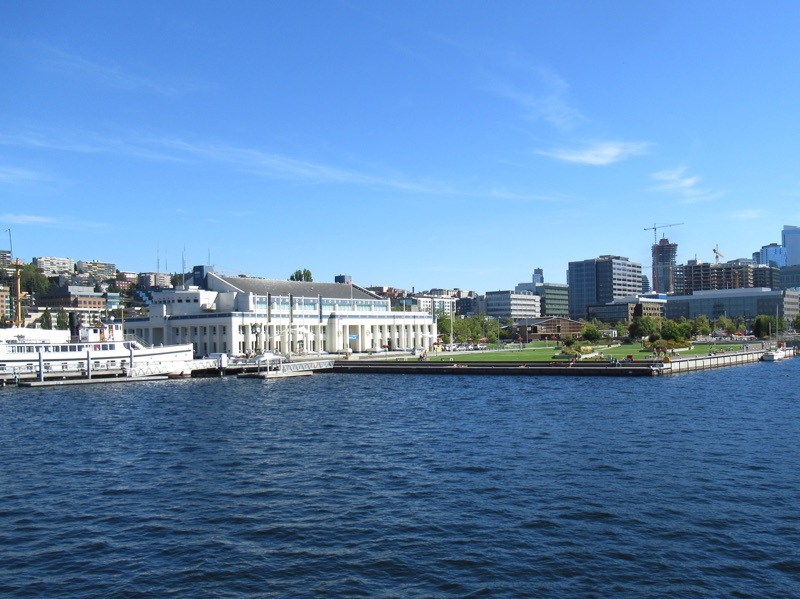 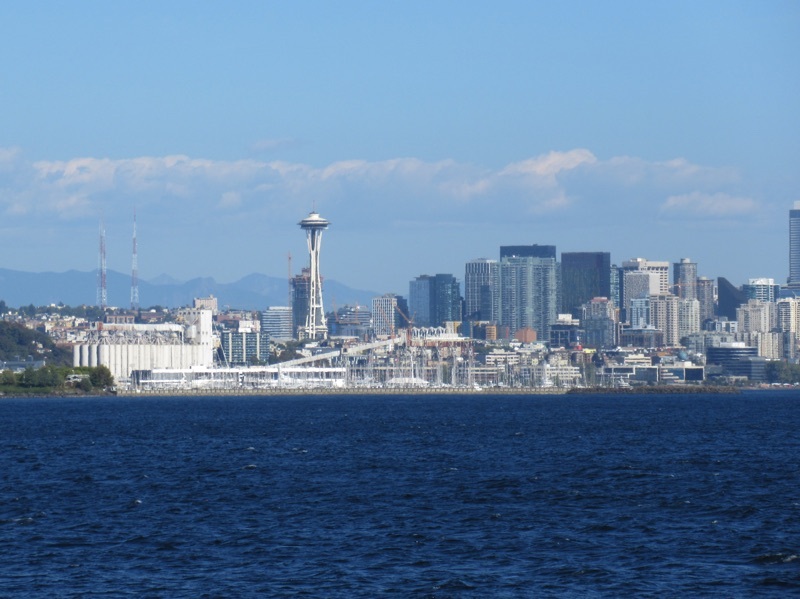 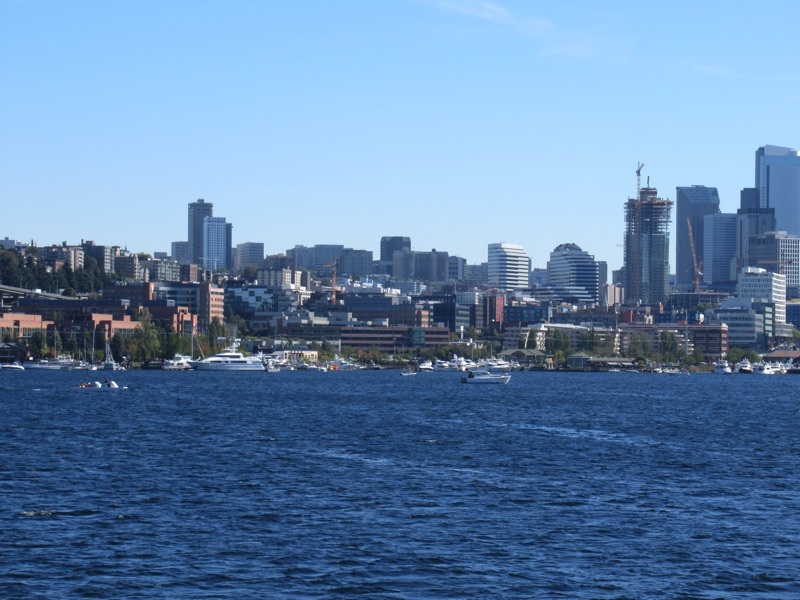 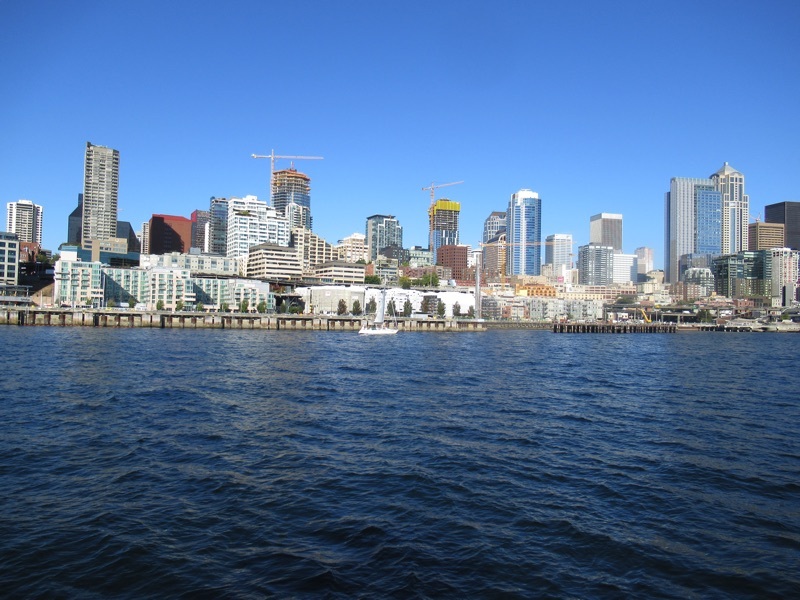 We always had the impression that Seattle had a working waterfront, and this cruise gave us a good look at it. 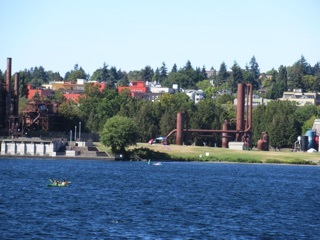 We headed out from near the MOHAI past moorings and working docks with views of construction, cancer research centers and Gas Works Park. 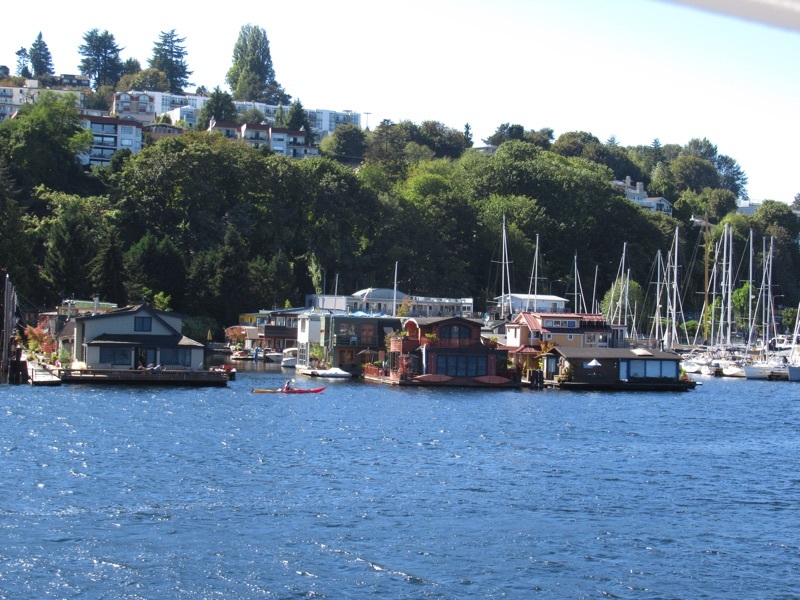 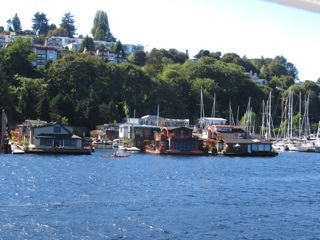 We admired the houseboats which are hard to see from land and passed under familiar bridges in a new direction. 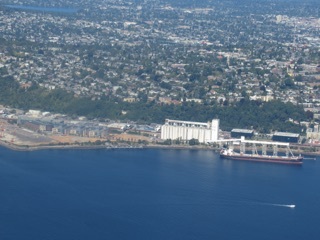 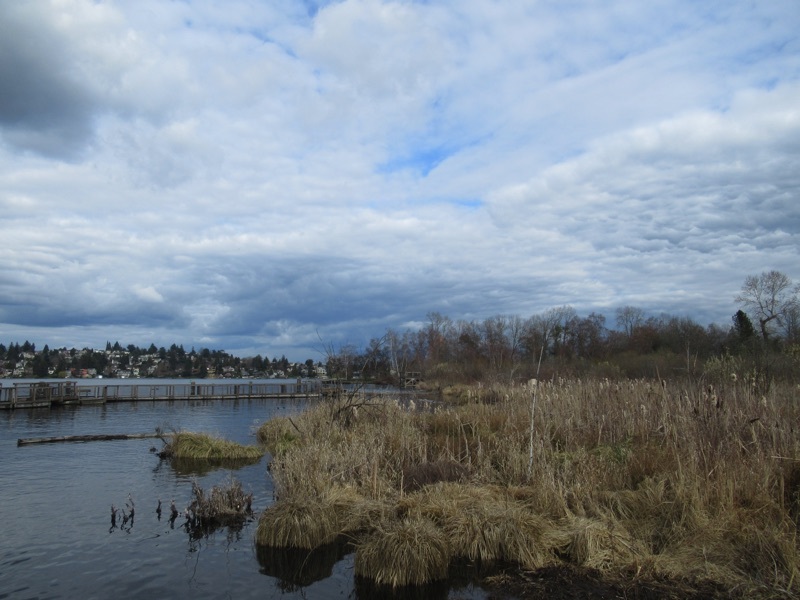 We knew the little waterfront park in Fremont, but from the water one could see the cut of the ship canal. 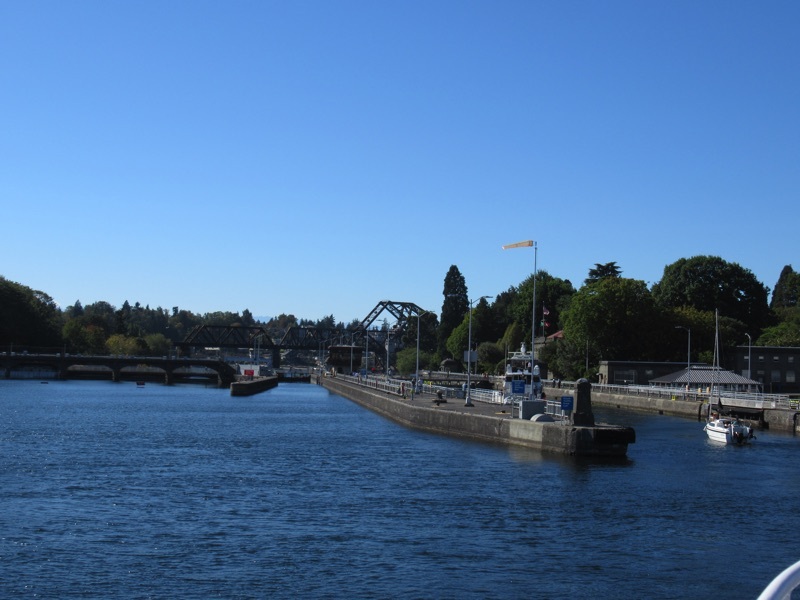 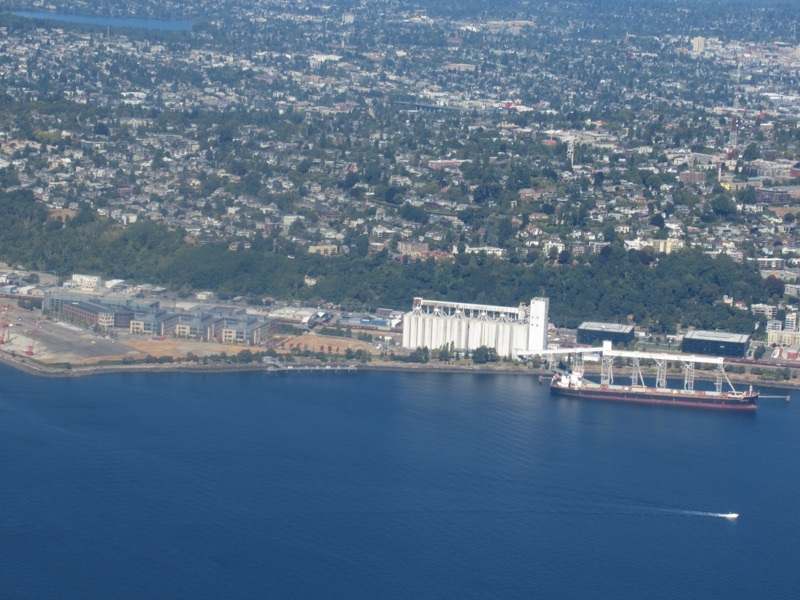 We passed dry docks and terminals and were soon at the Ballard Locks where we dropped twenty or thirty feet from fresh water to salt water. 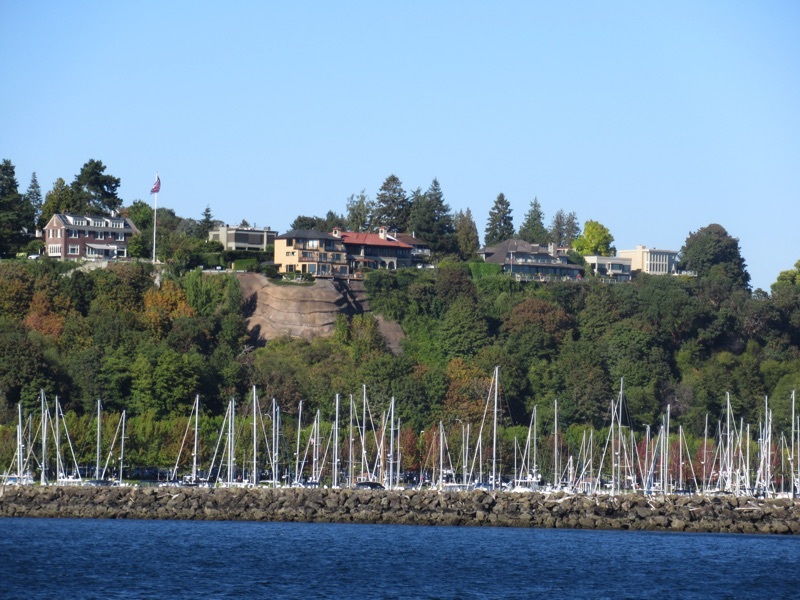 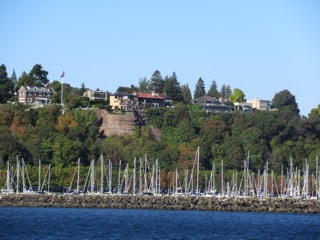 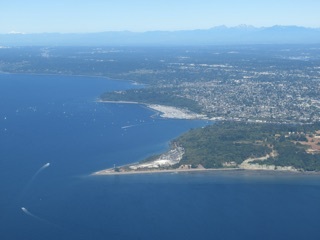 Then we headed out into the harbor passing by Discovery Park and the West Point Lighthouse. 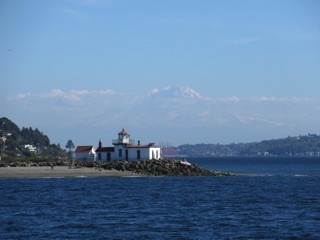 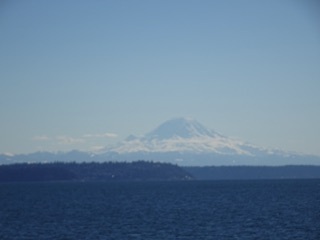 We could just make out the faint outline of Mount Rainier over the lighthouse as we passed. 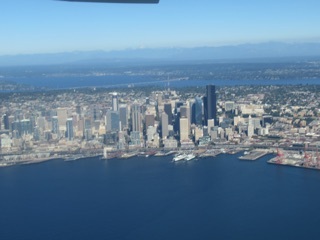 We rounded the point, and ahead were the harbor and downtown. 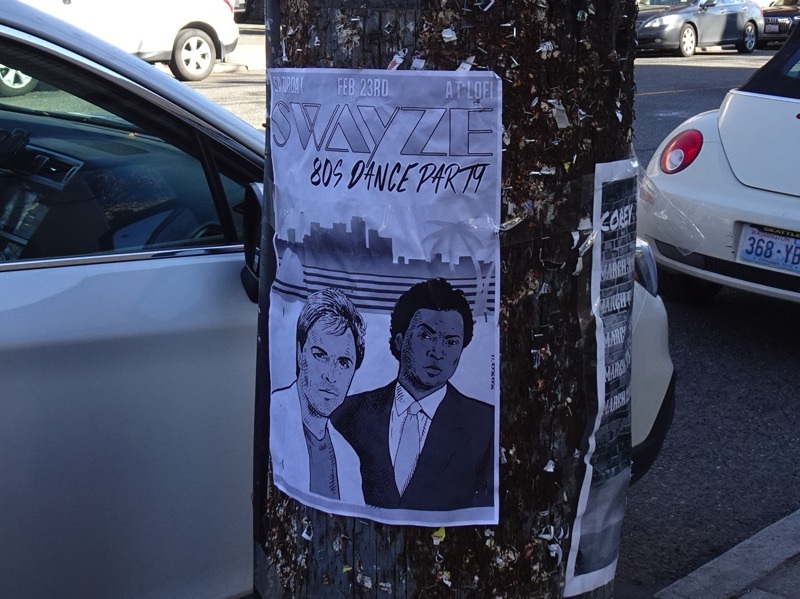 We made a quick trip into Seattle. 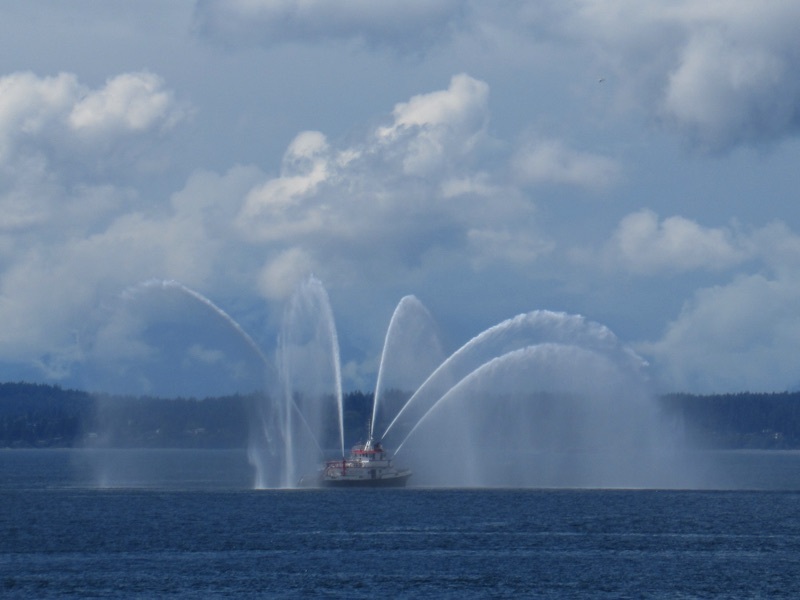 The fireboat Leschi greeted us in the harbor. 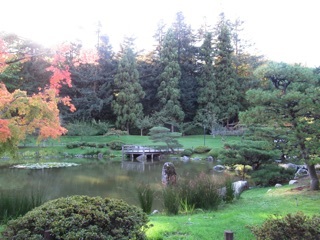 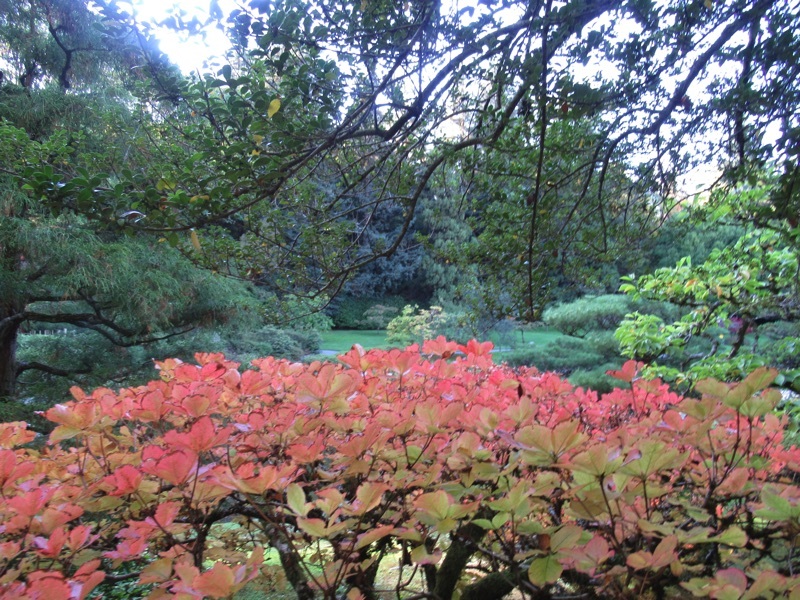 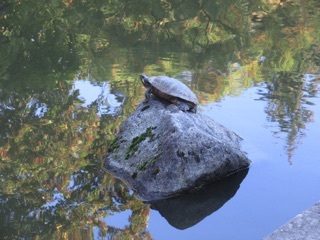 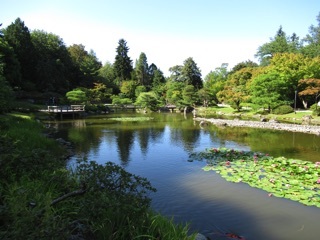 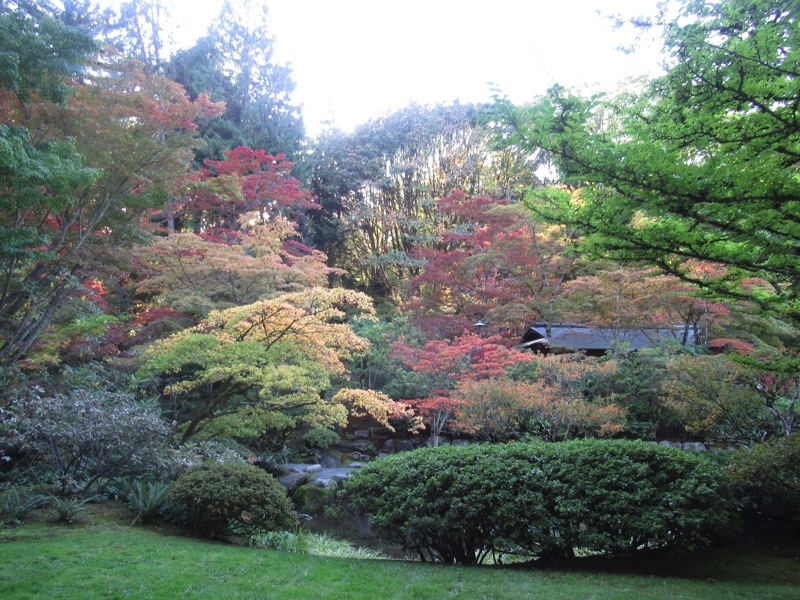 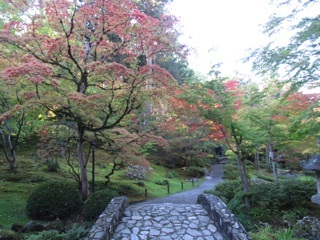 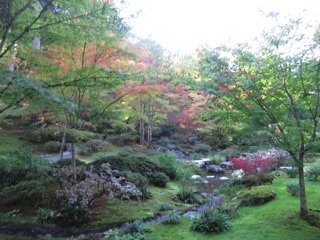 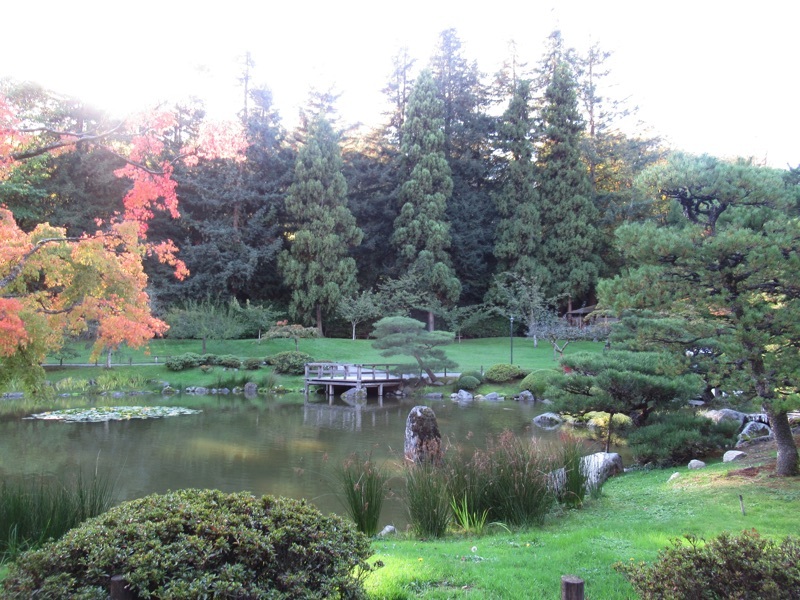 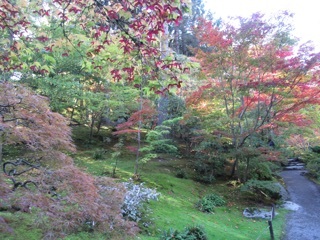 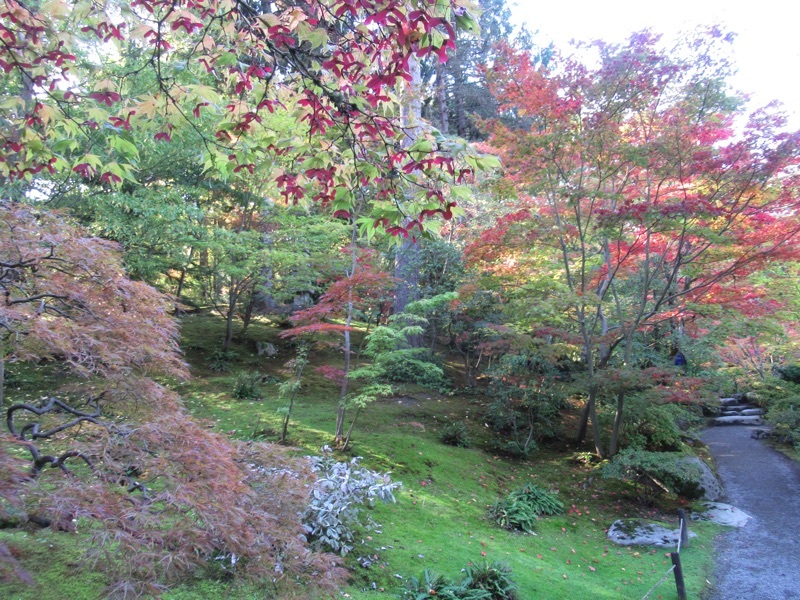 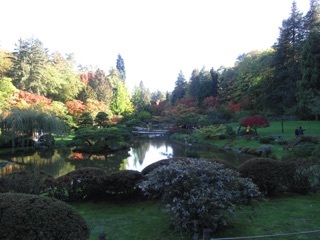 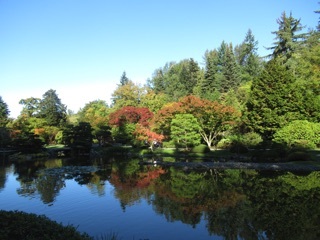 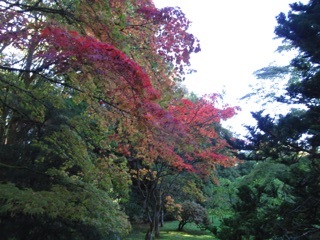 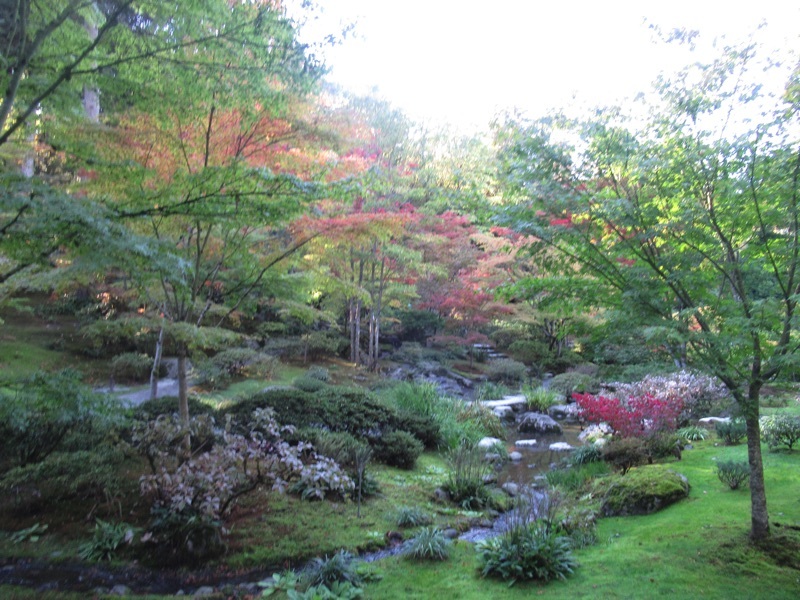 We visited the Japanese Garden. 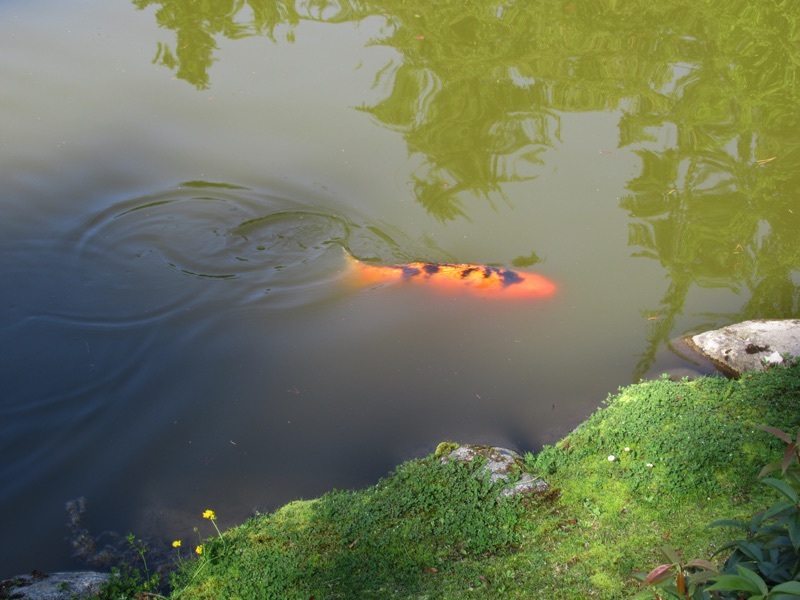 We did not eat the carp in the pond there. 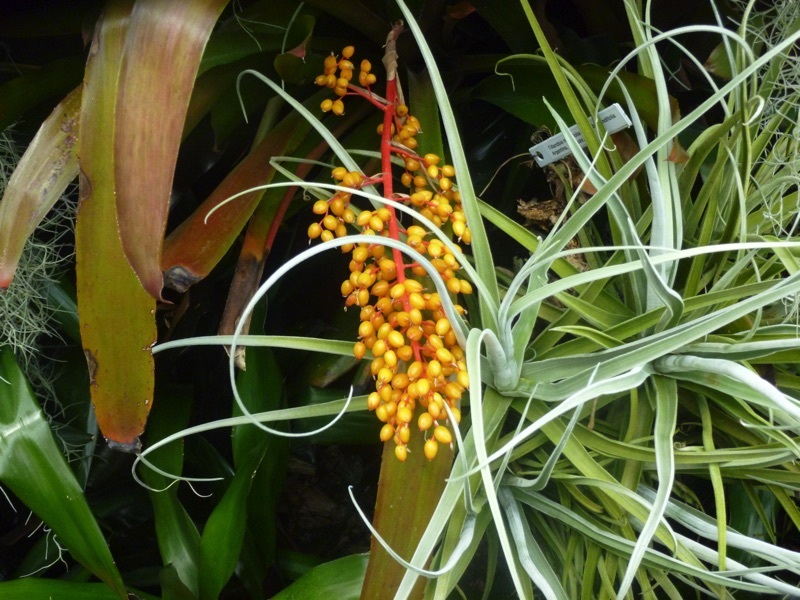 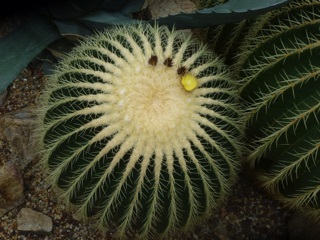 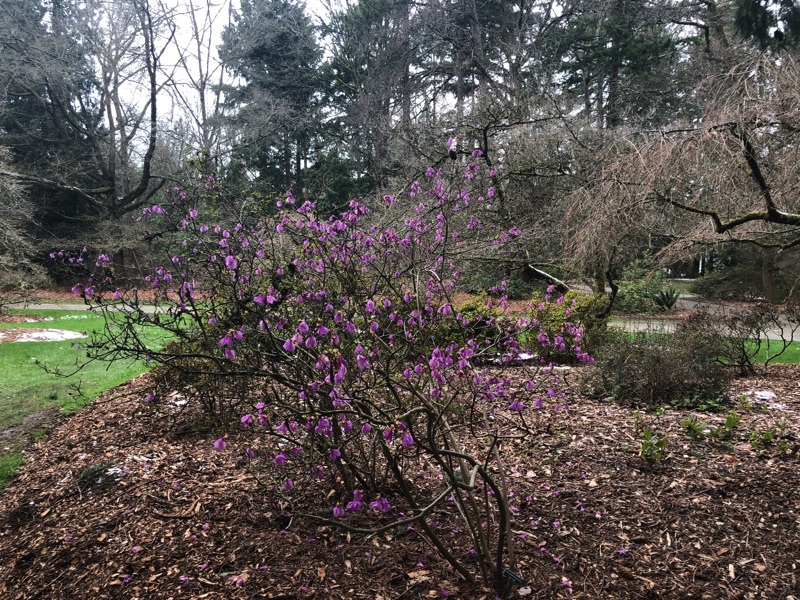 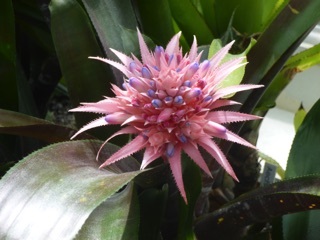 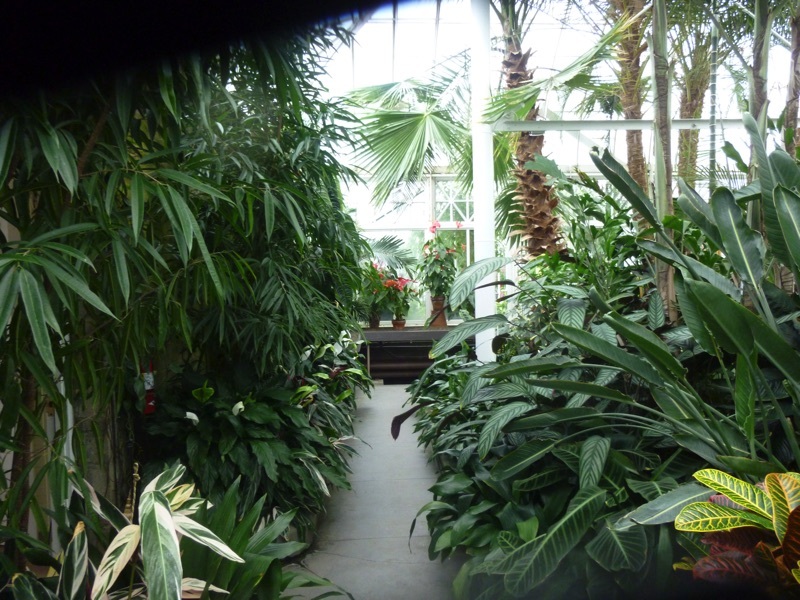 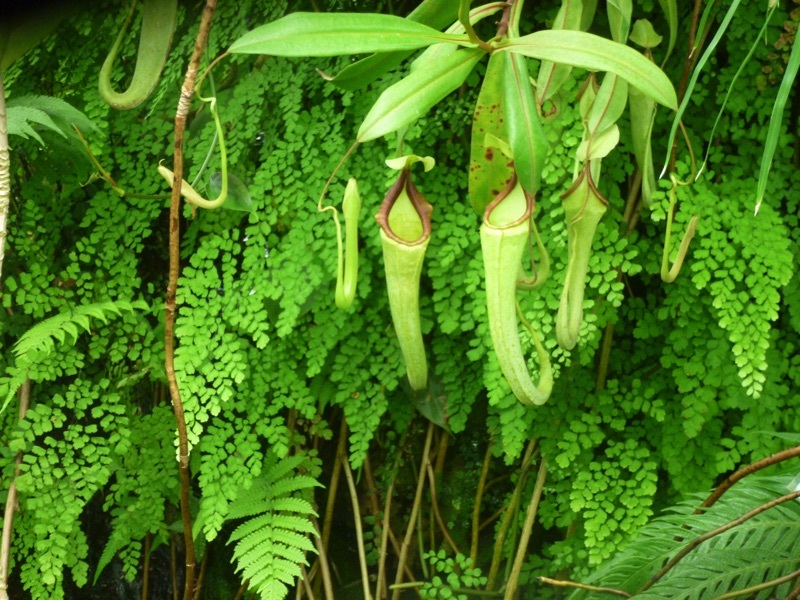 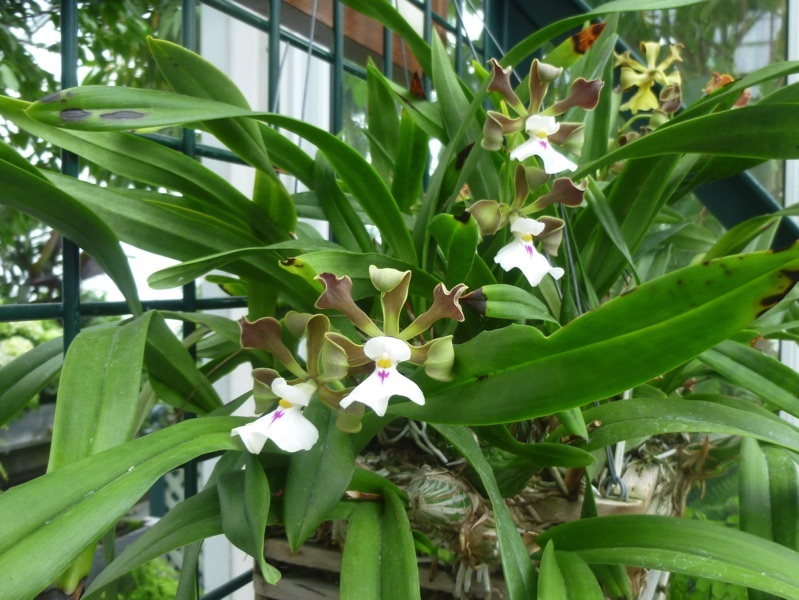 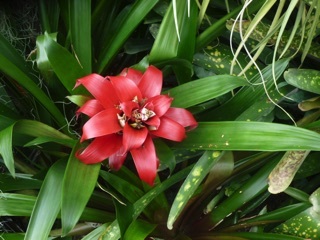 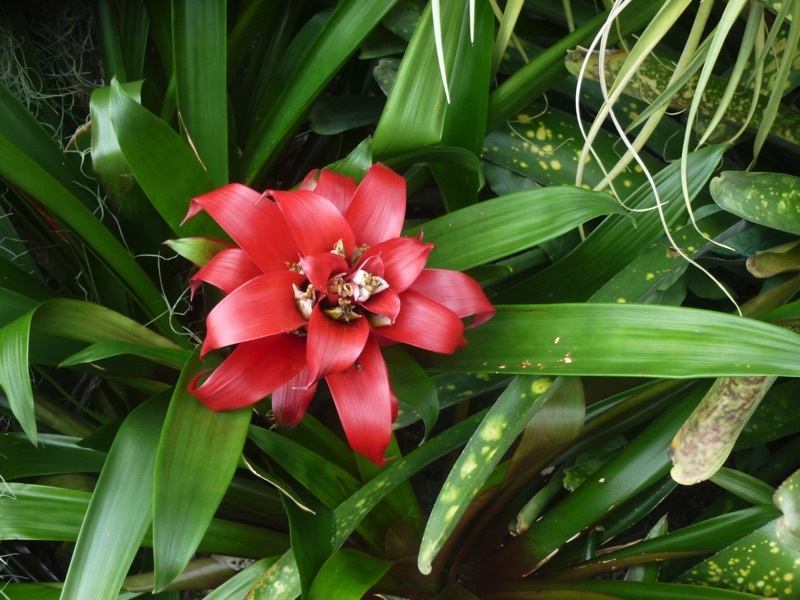 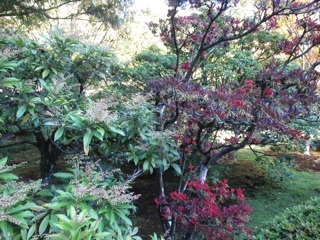 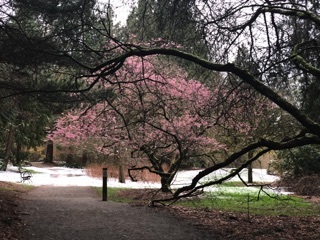 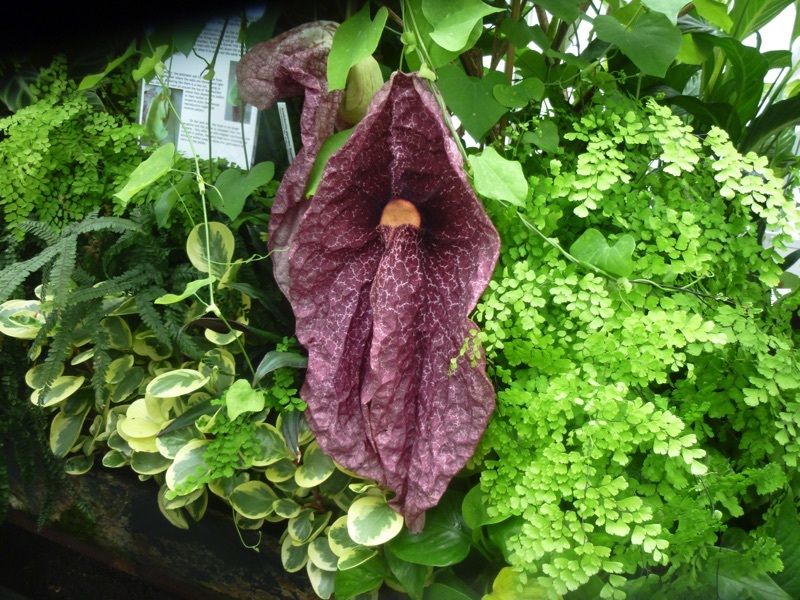 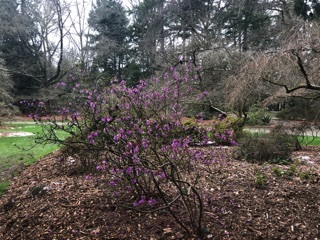 One of our favorite places in Seattle is the Volunteer Park Conservatory. 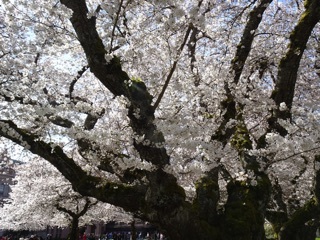 We missed it on our last few visits. 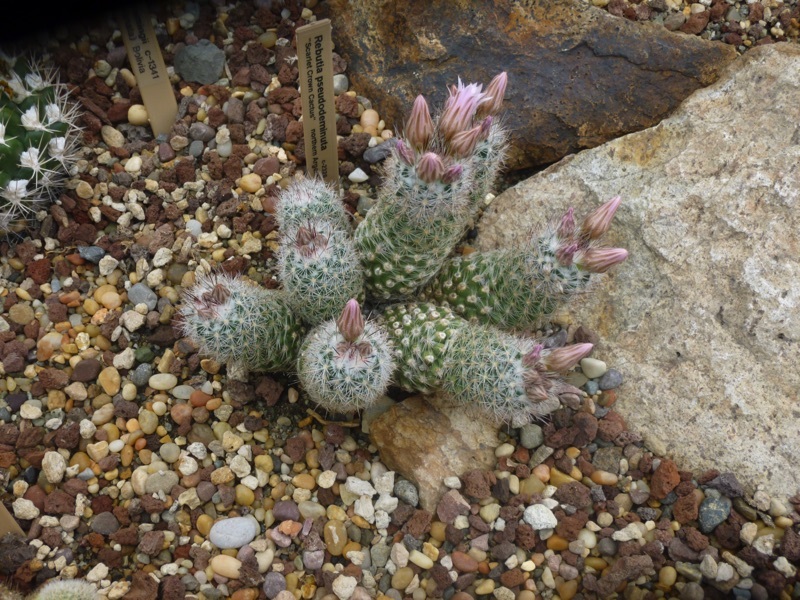 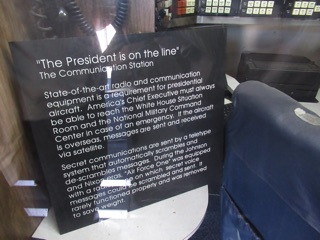 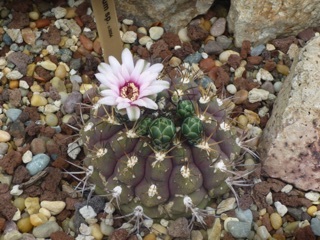 It closes at four, and sometimes it is closed when they are updating the plants on display. 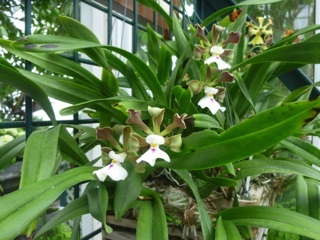 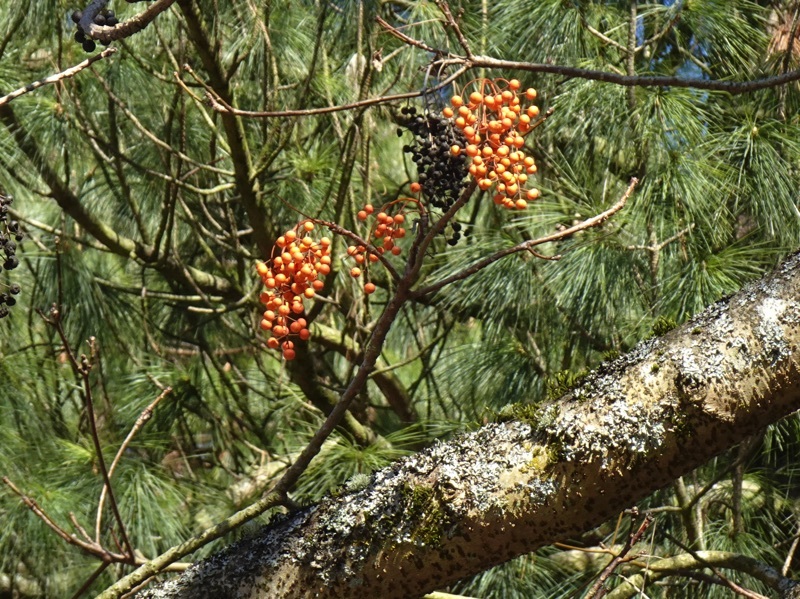 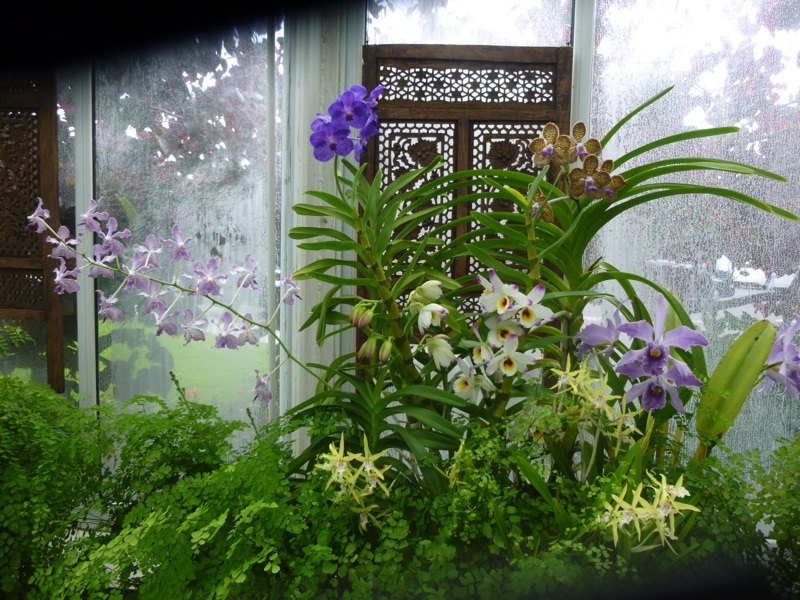 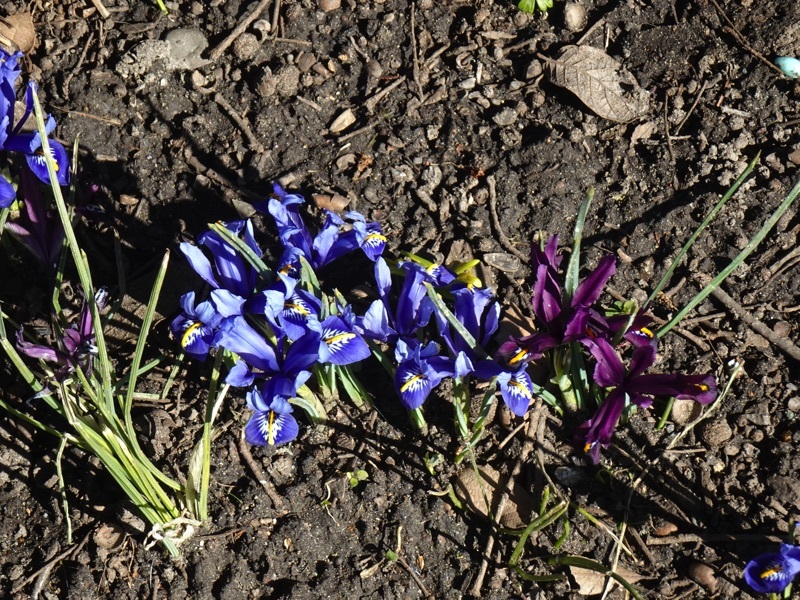 This last trip, however, we had the perfect spring conservatory experience. 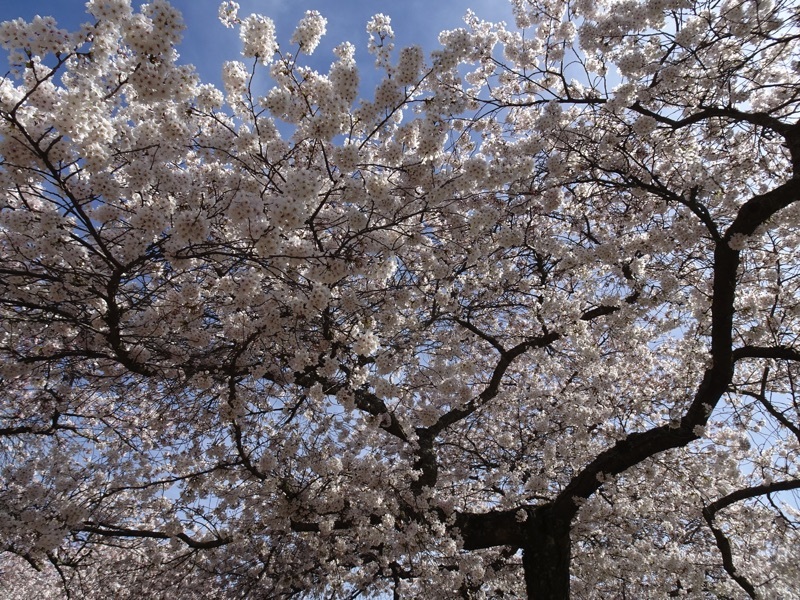 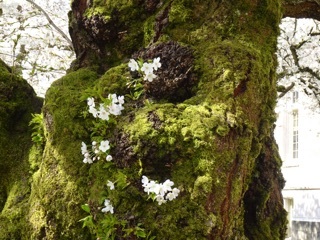 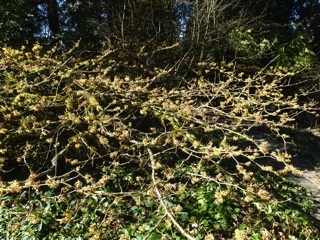 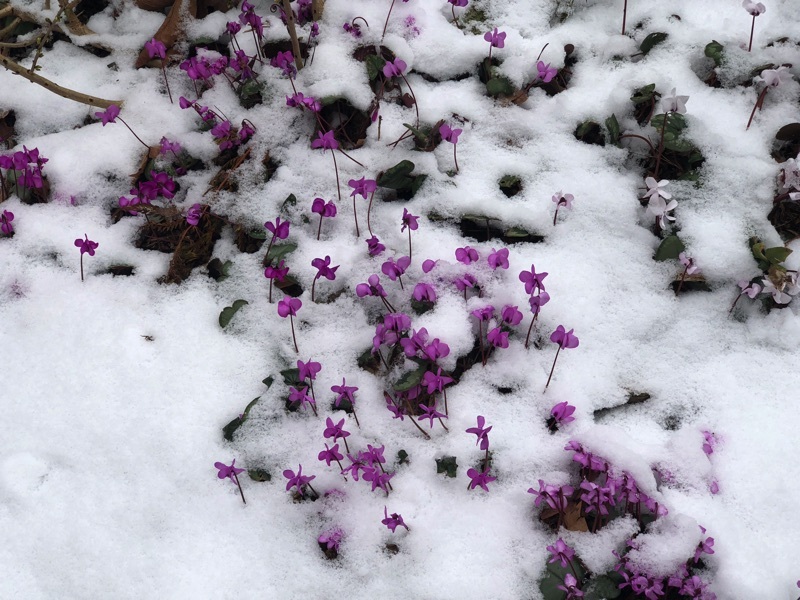 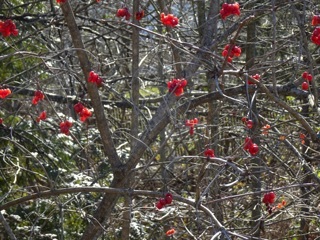 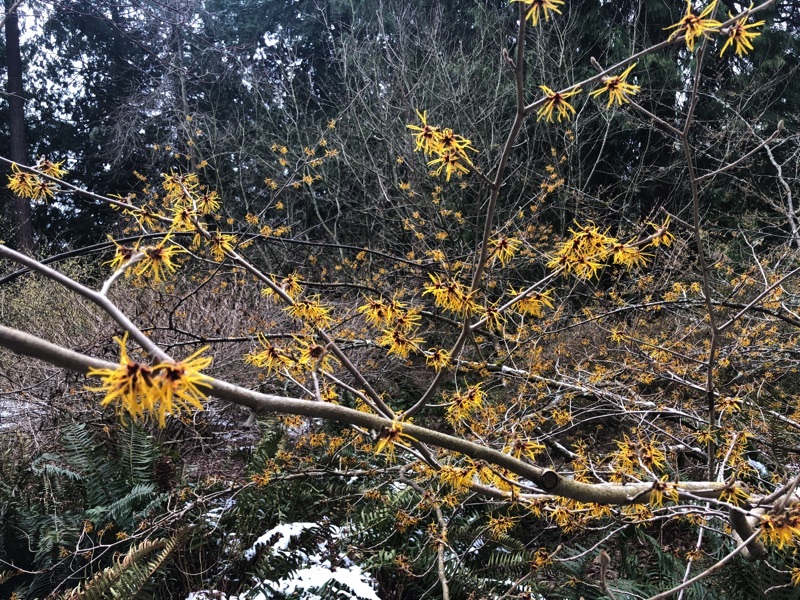 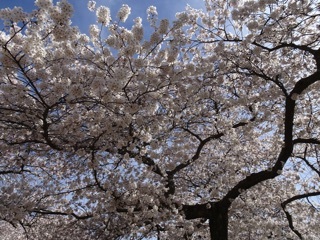 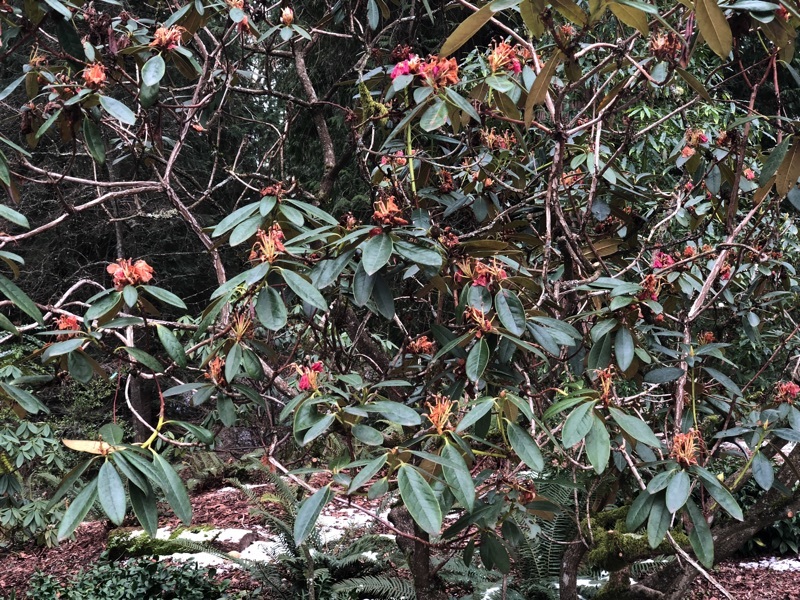 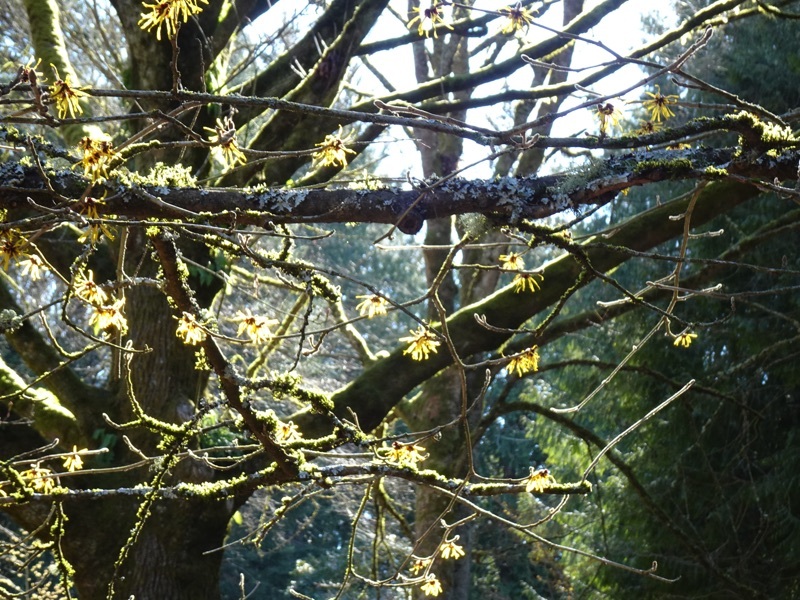 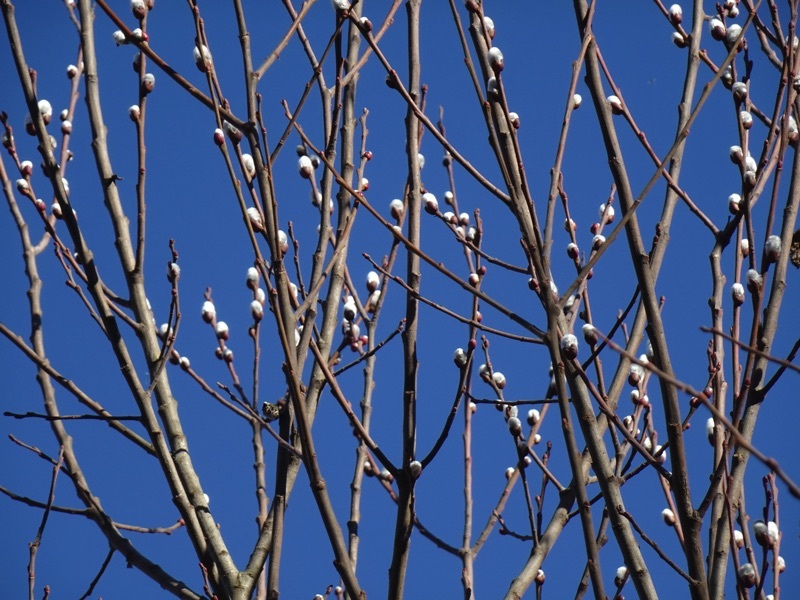 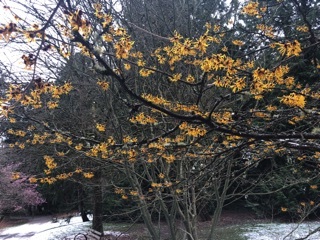 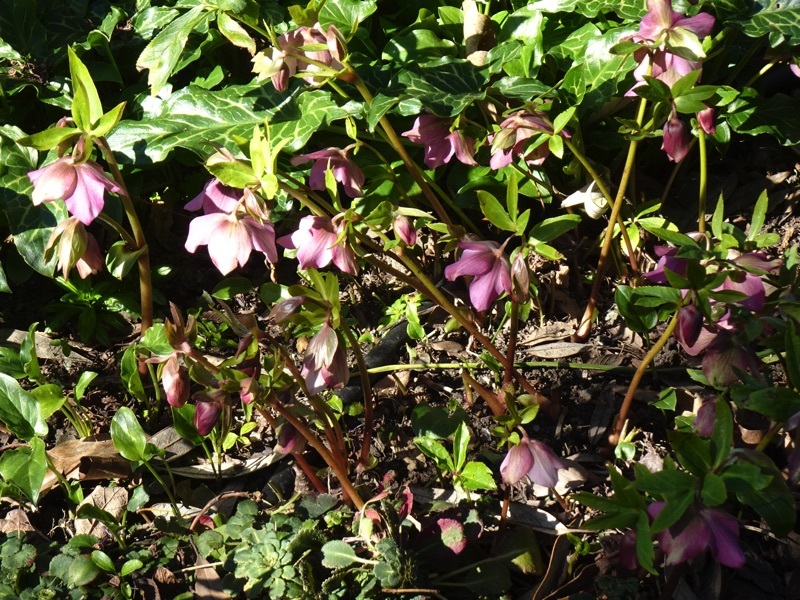 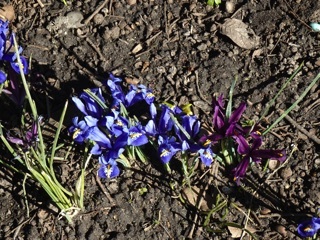 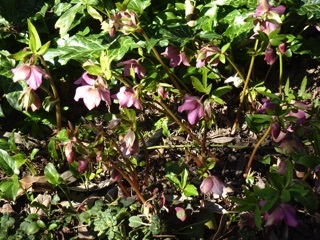 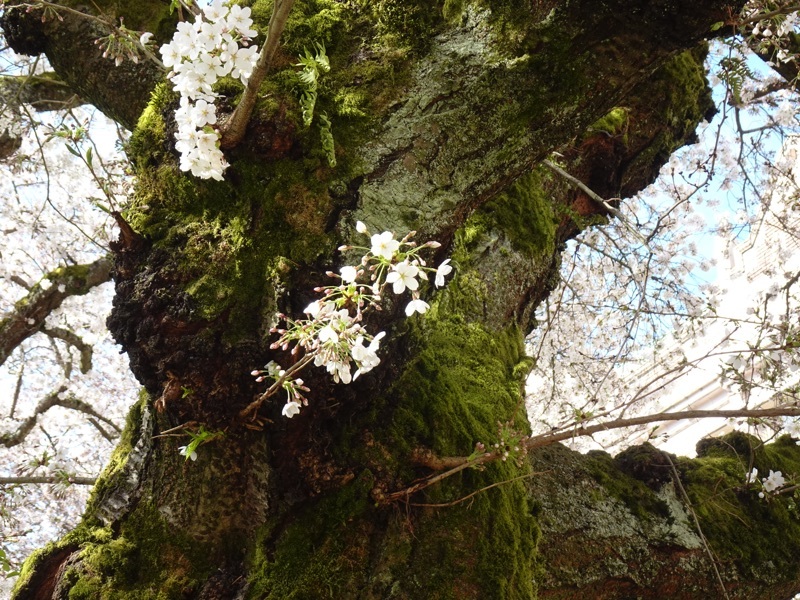 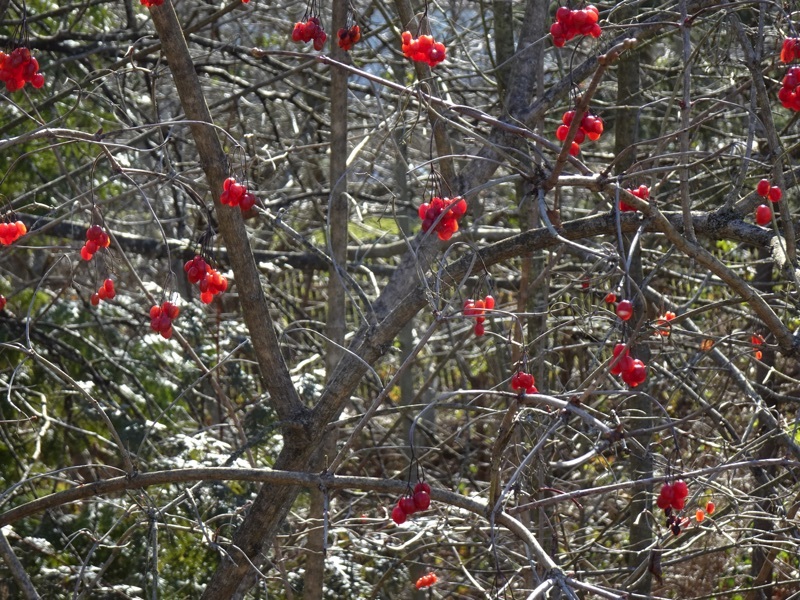 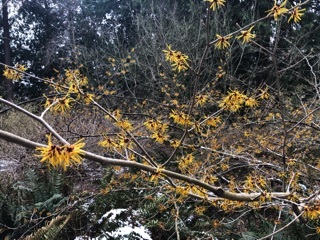 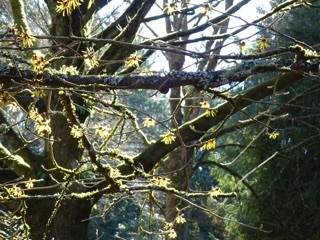 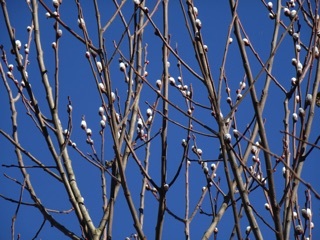 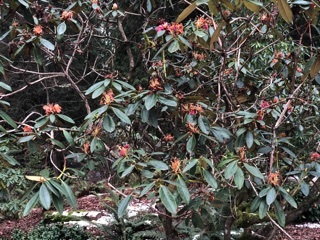 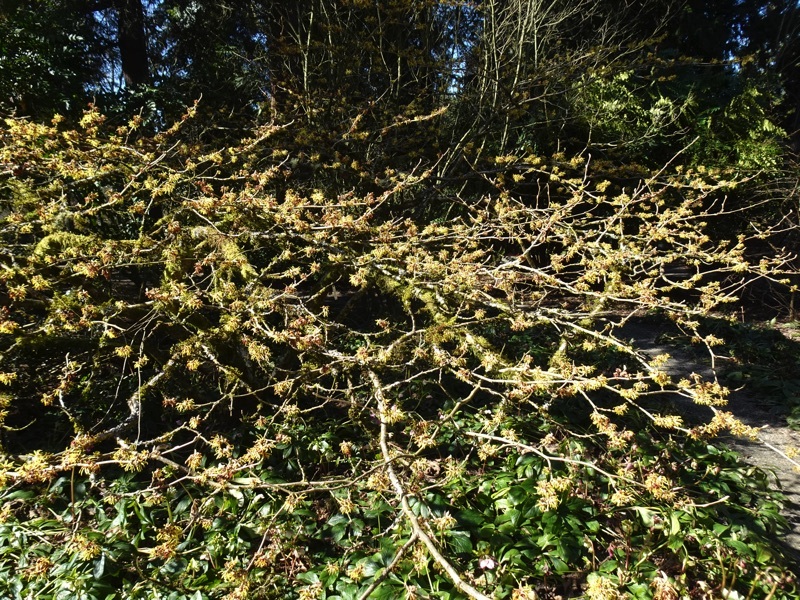 Everything seemed to be in bloom. 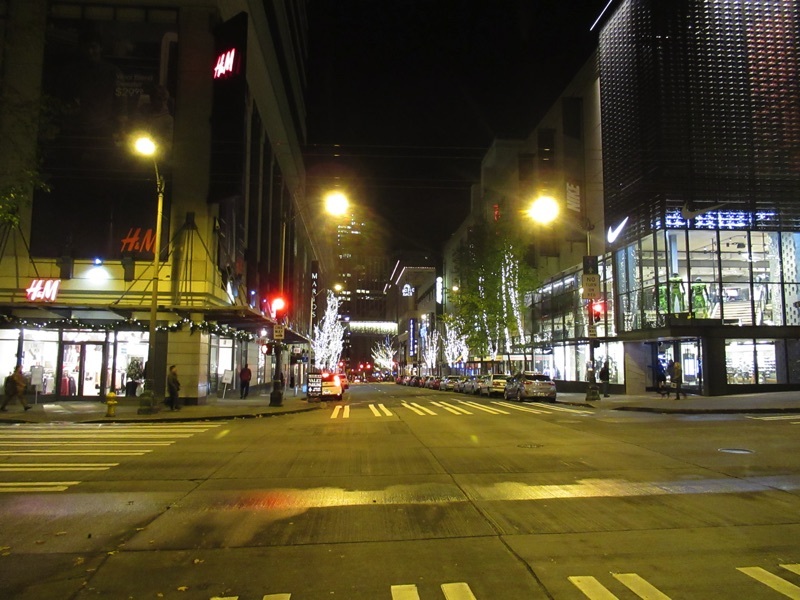 Coming from New York City where they make builders put up scaffolding to keep the sidewalks open even during the height of construction, Seattle seems anti-pedestrian with its policy of letting builders close sidewalks for months on end. 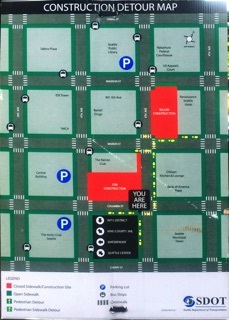 This has gotten worse thanks to the building boom in Seattle, so now they have to post maps for pedestrians to figure out which streets are actually passable. 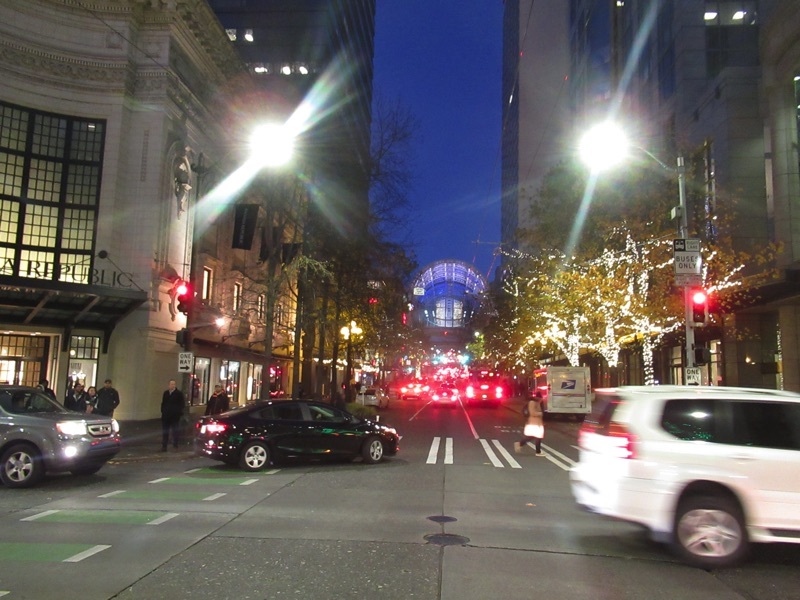 Maybe we need a pedestrian version of Waze, the application that helps drivers deal with traffic disruptions. It has gotten this bad.